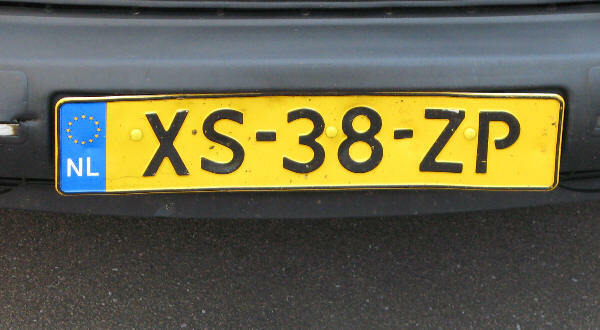 Current passenger series since May 2008 (starting at GBB), small size plate in black on yellow. The registration consists of two numerals, followed by a hyphen, three letters, a hyphen and one numeral. 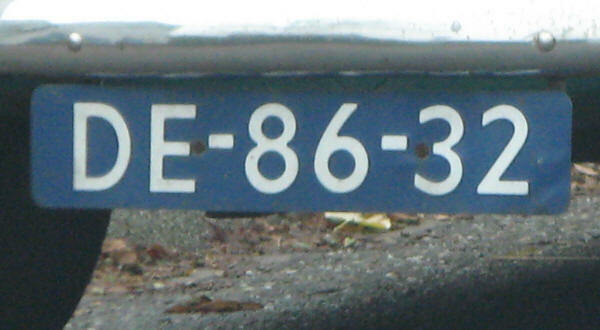 Left of the registration is a blue euroband with the oval NL in white below the twelve golden European stars. Current passenger series since May 2008 (starting at GBB) in black on yellow. Note that there is no euroband on smaller size plates. 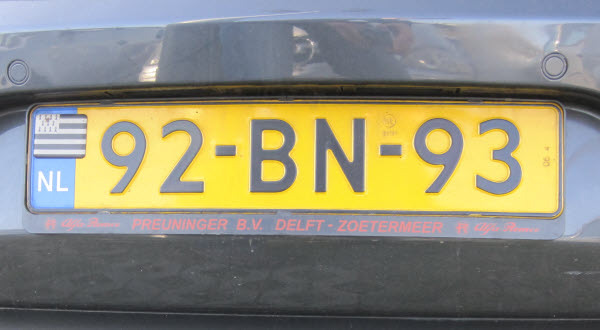 Former passenger series issued between 1999 and May 2008 in black on yellow, with euroband since 1st February 2000. The registration consists of two numerals, followed by a hyphen, two letters, a hyphen and two letters. The registration consists of two numerals above two letters, a hyphen and two letters. 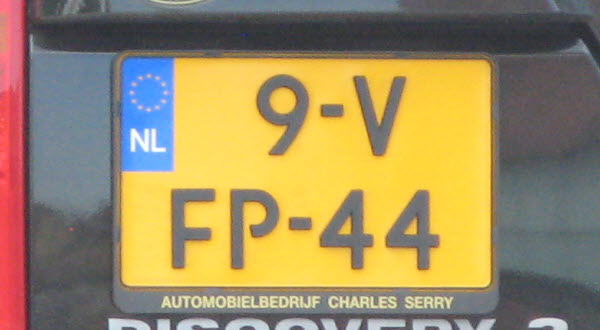 Former passenger series issued between 1999 and May 2008 in white on Prussian blue. 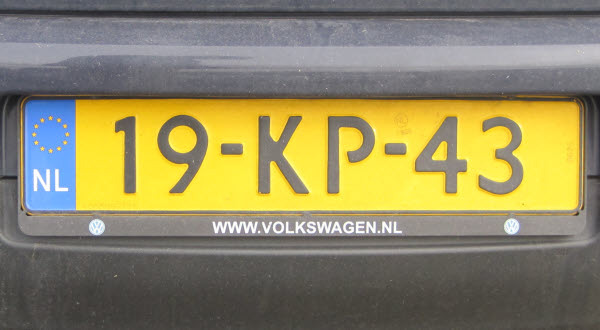 Former passenger series issued between 1991 and 1999 in black on yellow, with euroband since 1st February 2000 (remade). The registration consists of two letters, followed by a hyphen, two letters, a hyphen and two numerals. 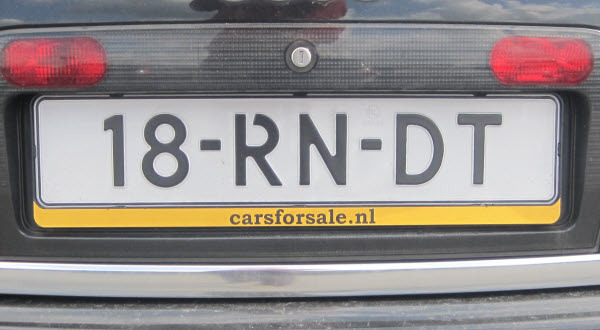 Former passenger series issued between 1991 and 1999 in black on yellow. 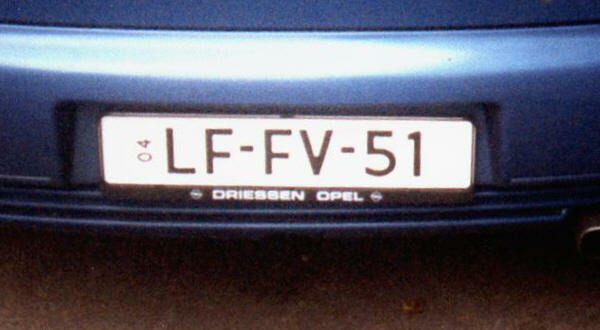 Former passenger series issued between 1991 and 1999 in white on Prussian blue. The registration consists of two letters, above two letters, a hyphen and two numerals. Former passenger series issued between 1978 and 1991 in black on yellow, with euroband since 1st February 2000 (remade). The registration consists of two letters, followed by a hyphen, two numerals, a hyphen and two letters. Former passenger series issued between 1973 and 1978 in black on yellow, with euroband since 1st February 2000 (remade). The registration consists of two numerals, followed by a hyphen, two letters, a hyphen and two numerals. Former passenger series issued between 1973 and 1978 in white on Prussian blue. The registration consists of two numerals, followed by two letters, a hyphen and two numerals. 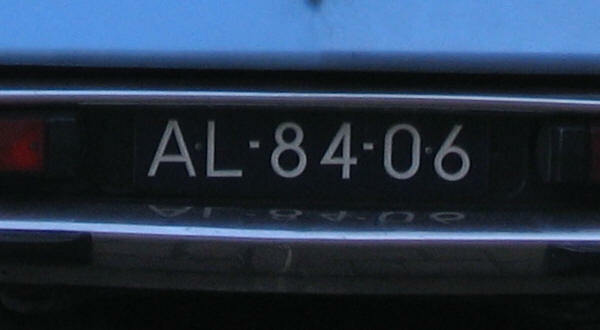 The registration consists of two numerals above two letters, a hyphen and two numerals. Former passenger series issued between 1965 and 1973 in black on yellow, with euroband since 1st February 2000 (remade). The registration consists of two numerals, above two numerals, a hyphen and two letters. 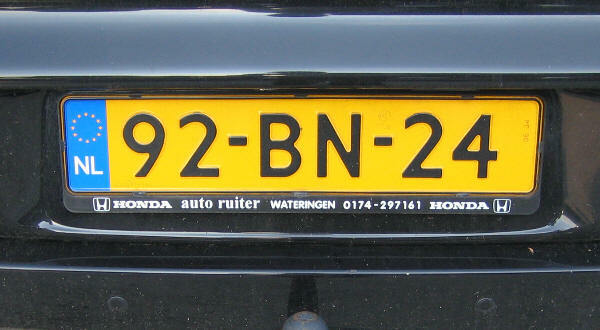 Top left of the registration is a blue euroband with the oval NL in white below the twelve golden European stars. Former passenger series issued between 1965 and 1973 in white on Prussian blue. The registration consists of two numerals, followed by a hyphen, two numerals and two letters. The registration consists of two numerals, followed by a hyphen, two numerals above two letters. The registration consists of two numerals, followed by a hyphen and two numerals above two letters. Former passenger series issued between 1965 and 1973 in white on light blue. 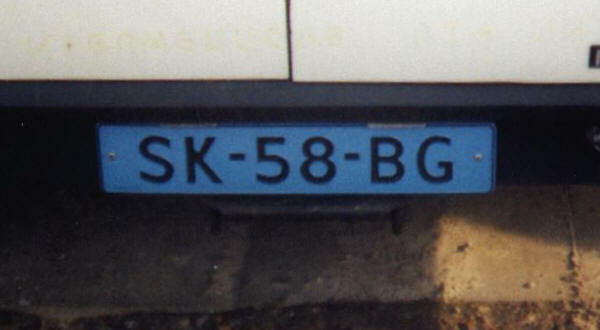 The light blue colour was used since 1976. Former passenger series issued between 1951 and 1965 in white on Prussian blue. The registration consists of two letters, followed by two numerals, a hyphen and two numerals. 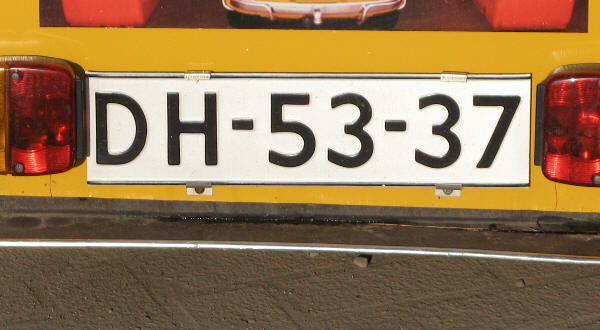 The registration consists of two letters, above two numerals, a hyphen and two numerals. Former passenger series issued between 1999 and May 2008 in black on yellow, American size. 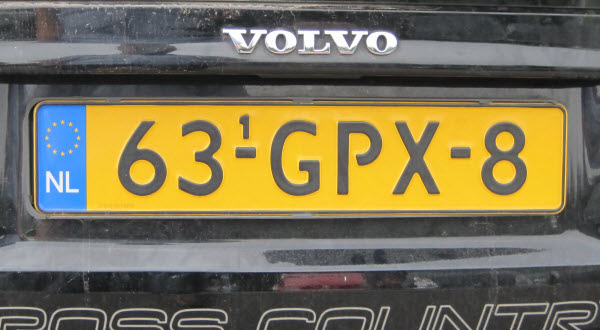 Former passenger series issued between 1999 and May 2008 in black on yellow, smaller size. Note the strange spacing. 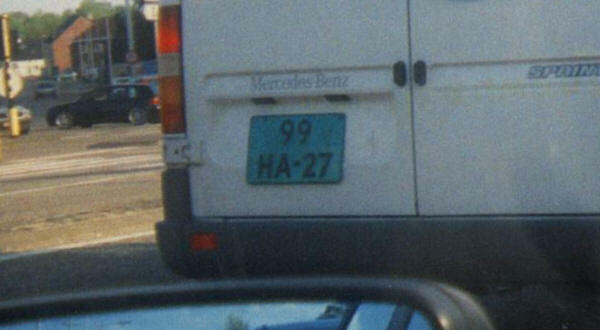 This driver was really unfriendly and didn´t give any information. 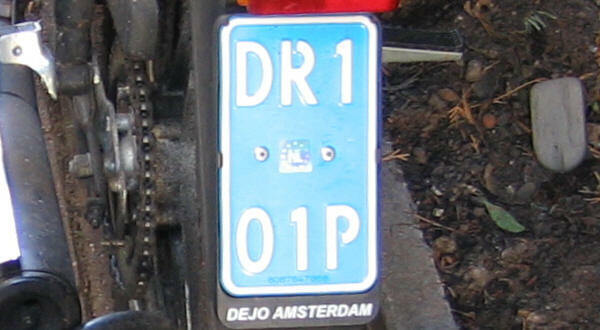 Former bicycle rack series issued between 1999 and May 2008 in black on white, no euroband. 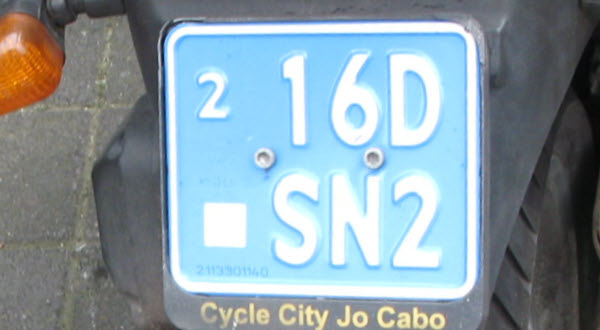 Former bicycle rack series issued between 1991 and 1999 in black on white, no euroband. Bicycle rack series issued for a pre-1973 series since 1992 in black on white. The registration consists of the letter D, followed by one letter, a hyphen, two numerals, a hyphen and to numerals. 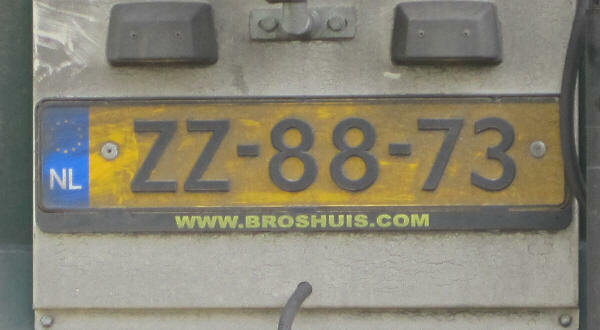 Current trailer over 750 kg series since 2000 in black on yellow. 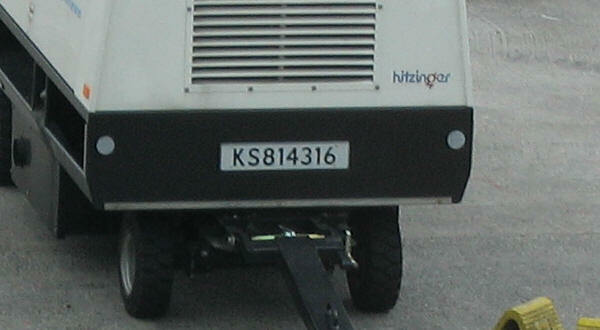 The letter O is used for trailers. 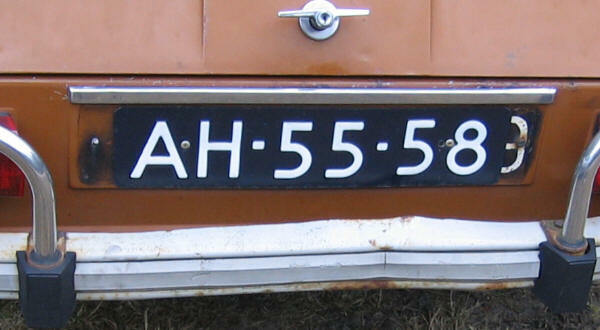 This is the original registration where above the first hyphen is a small 1, indicating a first replacement plate. 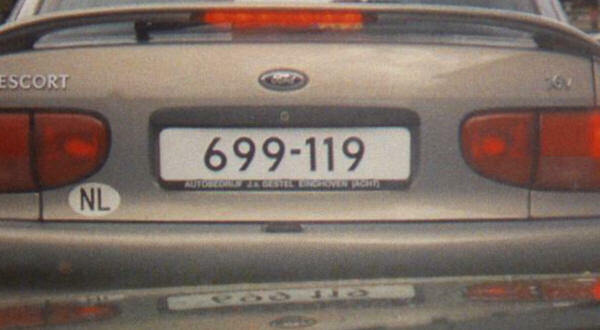 This 1 is given when the driver loses his papers or when the plate is stolen or destroyed. 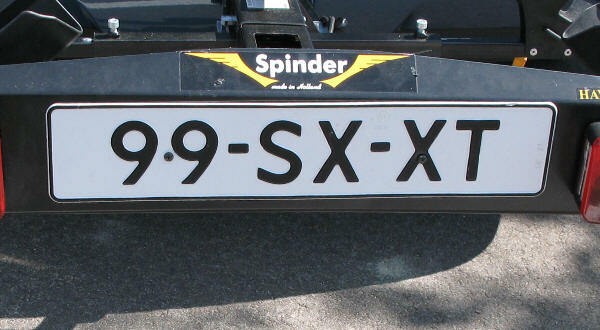 Current trailer over 750 kg series since 2000, two line plate in black on yellow. 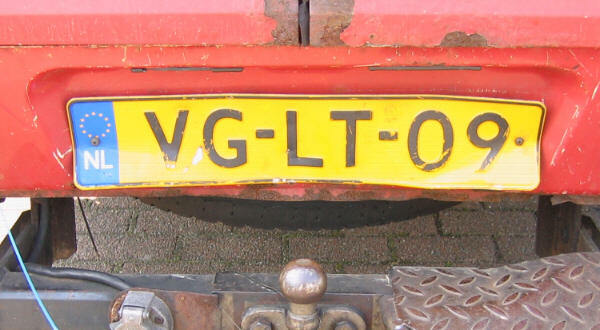 The letter O is used for trailers. The registration consists of two letters, followed by a hyphen , two numerals above two letters. 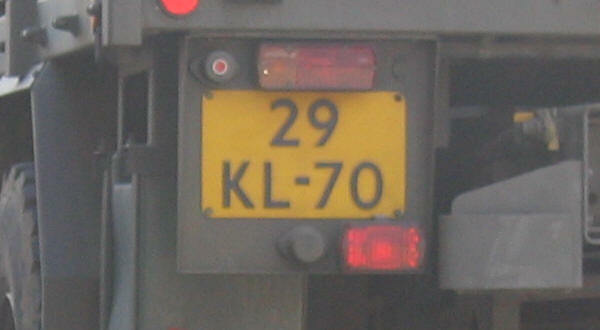 Former trailer over 750 kg series issued between 1976 and 2000 in black on yellow. 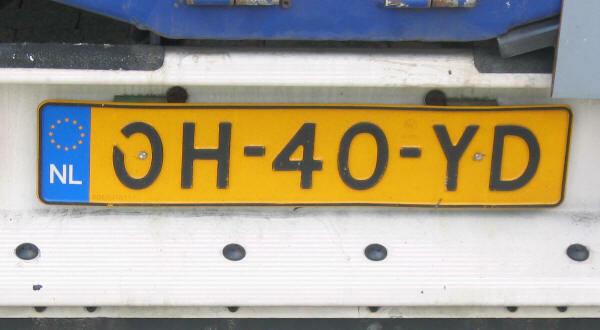 The letter O is used for semi-trailers. The registration consists of two letters, followed by a hyphen, two numerals, a hyphen and two numerals. 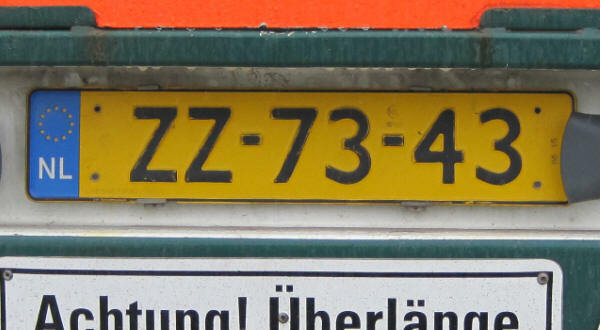 Former trailer over 750 kg series issued between 1976 and 2000 in black on yellow. 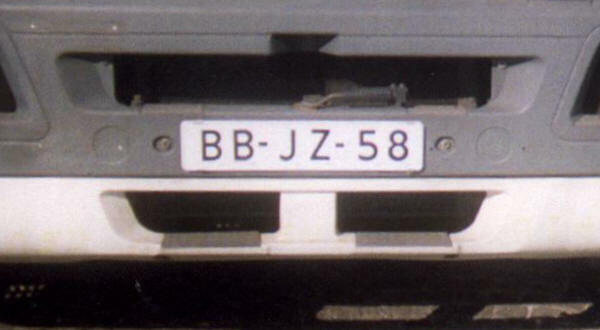 The letter O is used for trailers. 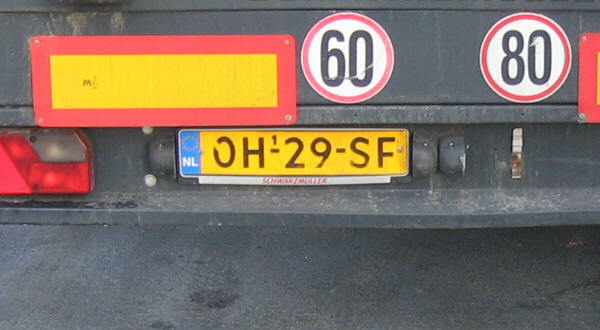 Former trailer series over 750 kg issued between 2000 and 2008 in black on yellow. The registration consists of the letter W, followed by one letter, a hyphen, two letters, a hyphen and two numerals. 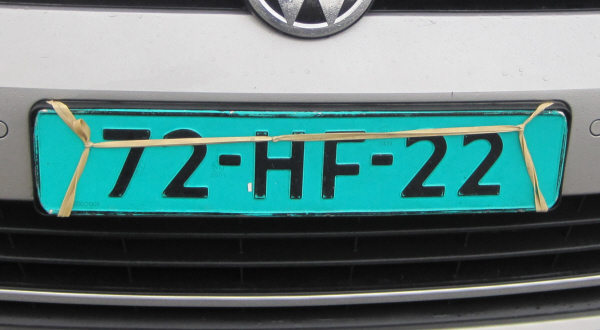 The letter W stands for aanhangwagen (trailer). 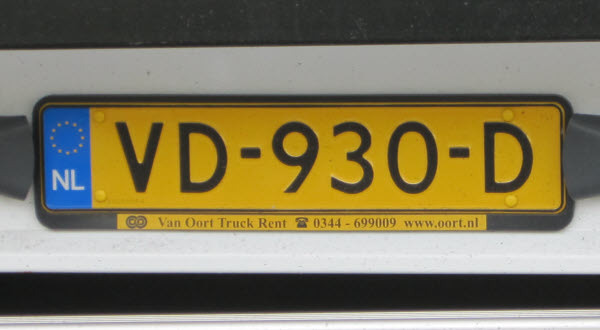 Former trailer repeater series issued between February 2000 and January 2003 in black on white. 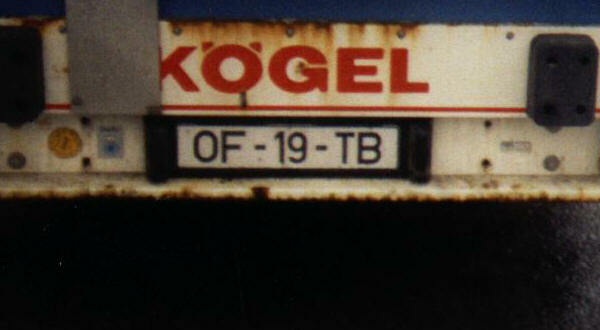 This is a repeater plate of the towing truck. 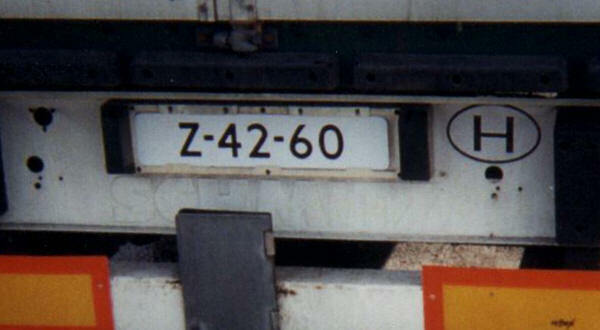 Since 2003, trailers above 750 kg should have their own plate. 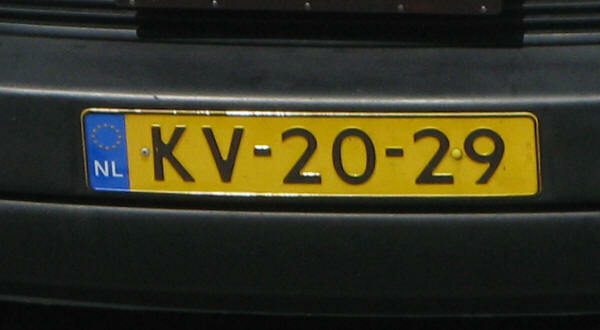 Former trailer series over 750 kg issued between 1998 and 2000 in black on yellow. The registration consists of the letter W, followed by one letter, a hyphen, two numerals, a hyphen and two letters. 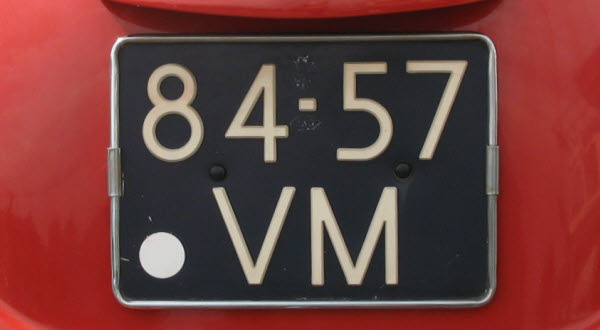 At the right is a special trailer plate (called Fino plate) in a white on red in diamond shape. 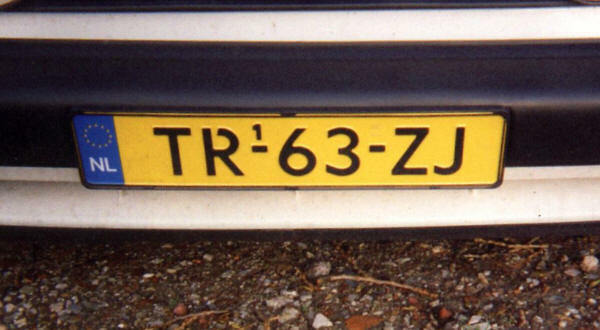 This plate has the same registration as the regular plate with the first two letter, above the other four. 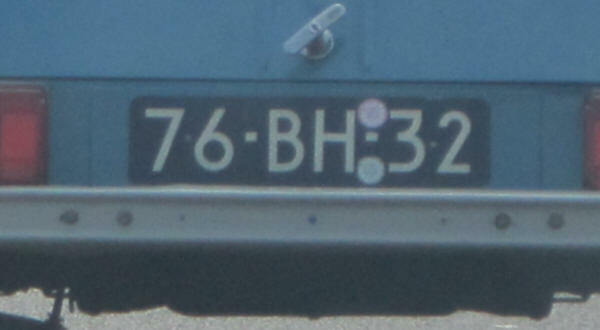 The last number beneath denotes the vehicles weight in 100 kg. 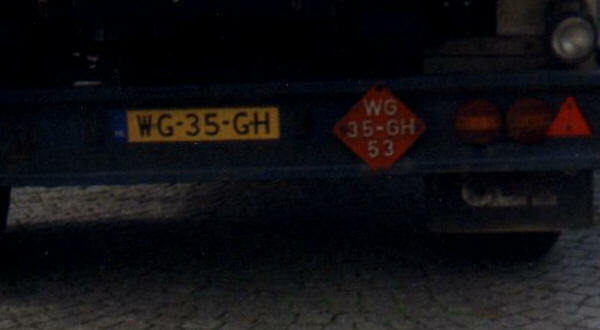 53 in this case means that the weight is 5300 kg. 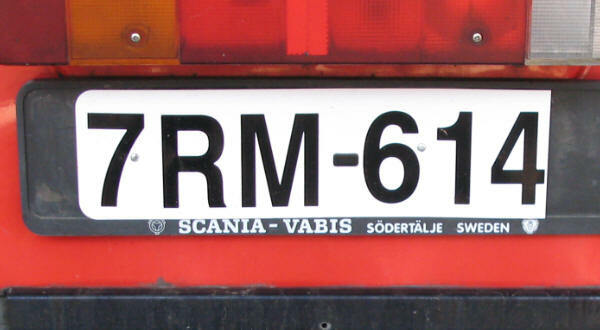 Former special trailer series issued between 1 Oct 88 and 1992 in black on white. The registration consists the letter O, followed by one letter, two numerals and two letters. The letter O stands for oplegger (trailer). The registration consists the letter O, followed by one letter, a hyphen, two numerals, a hyphen and two letters. 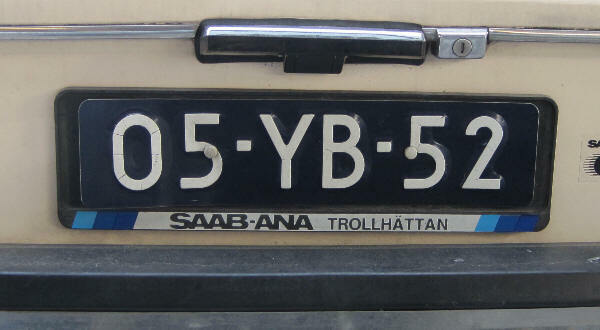 Former trailer series issued between 1963 and 1977 in black on yellow. The registration consists of two numerals, followed by a hyphen, the letter W, one letter, a hyphen and two numerals. 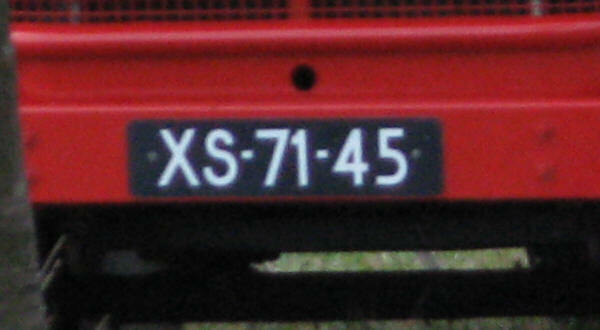 The series is used for trailer over 750 kg where W stands for trailer (aanhangwagen). Current diplomatic series since February 1991 in black on yellow. The registration consists of two numerals, a hyphen, the letters CD, a hyphen and two numerals. 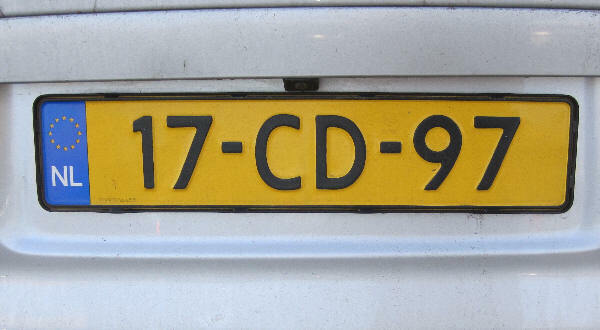 CD in between two pairs of numerals is used for International Organizations. The registration consists of the letters CD, a hyphen, two numerals, a hyphen and two numerals. 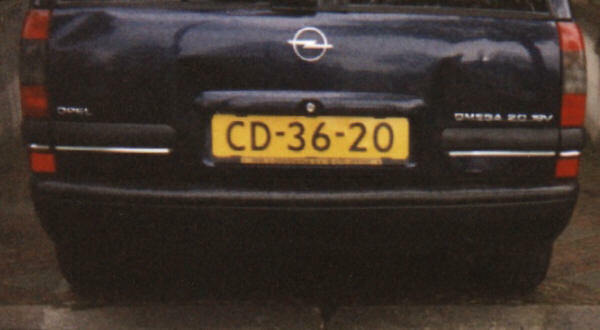 CD followed by two pairs of numerals is used for the Diplomatic Corps. The registration consists of the letters CD, a hyphen, two numerals, a hyphen and another two numerals. Current temporary replacement series in black on white, no euroband. The registration consists of two numerals, a hyphen, two letters, a hyphen, and two letters. of expiry, in this case August (08). The registration consists of two letters, a hyphen, two letters, a hyphen, and two numerals. of expiry, in this case April (04). 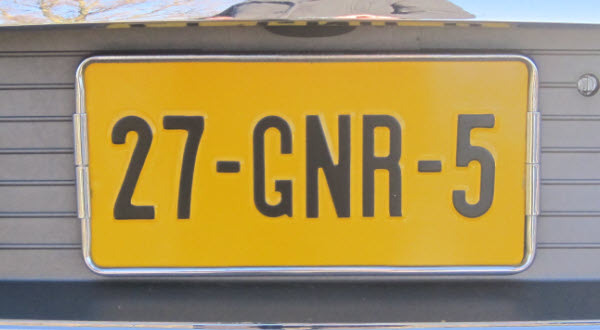 Current replacement series since May 2008 (starting at GBB), small size plate in black on yellow. 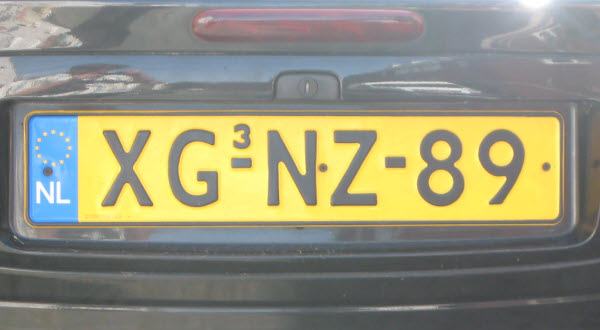 Former replacement series issued between 1999 and May 2008 in black on yellow. The registration consists of two numerals, followed by a hyphen, two letters, a hyphen, and two letters. 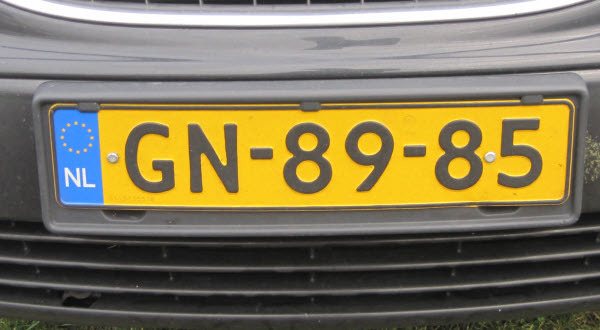 Left of the registration is a blue euroband with the oval NL below the twelve golden European stars. 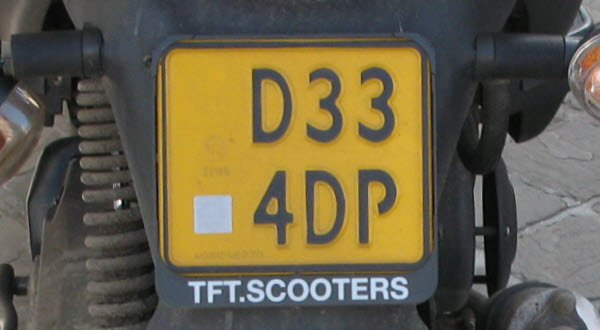 This is the original registration where above the first hyphen is a small 3, indicating a third replacement plate. 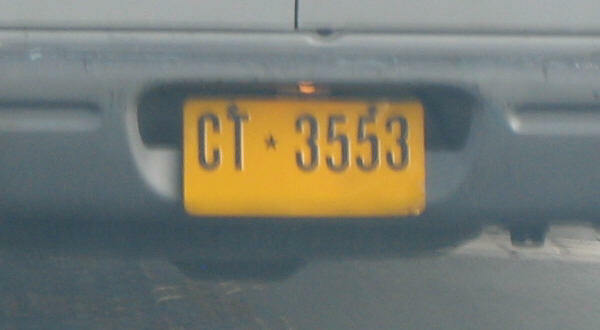 This 3 is given when the driver loses his papers or when the plate is stolen or destroyed for a third time. 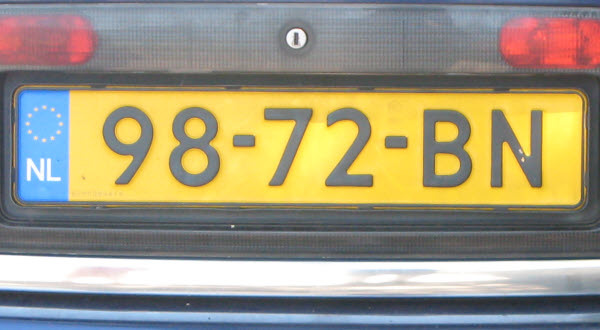 Former replacement series issued between 1991 and 1999 in black on yellow. 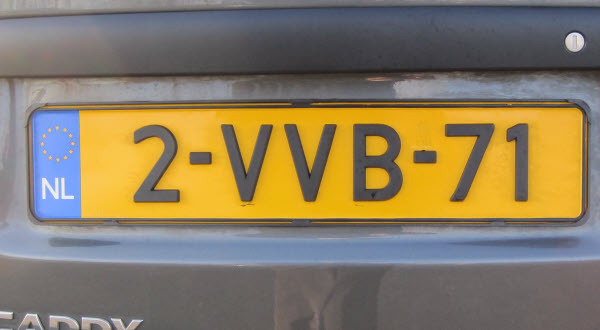 This is the original registration where above the first hyphen is a small 2, indicating a second replacement plate. 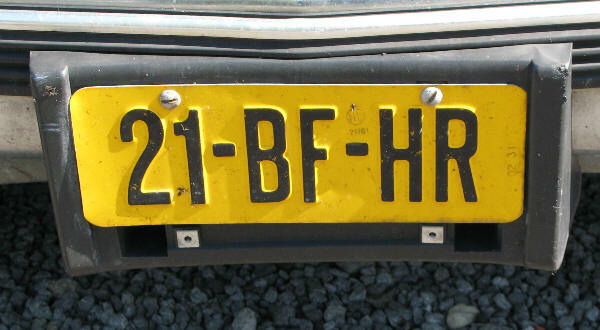 This 2 is given when the driver loses his papers or when the plate is stolen or destroyed for a second time. 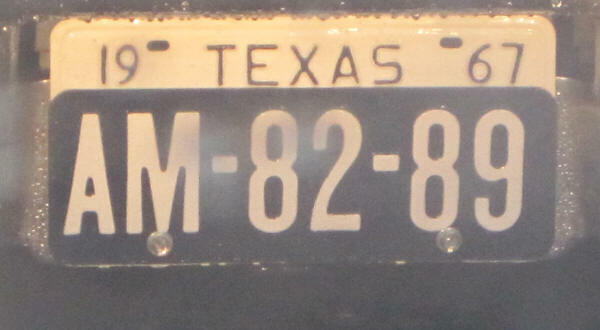 Former replacement series issued between 1978 and 1991 in black on yellow. Current replacement series since 2000 in black on yellow. The registration consists of two letters, a hyphen, two numerals, a hyphen, and two letters. Pre-1973 series since 1988 issued 1998 in white on blue. The registration consists of two numerals, a hyphen, the letter A, followed by one letter, a hyphen and two numerals. 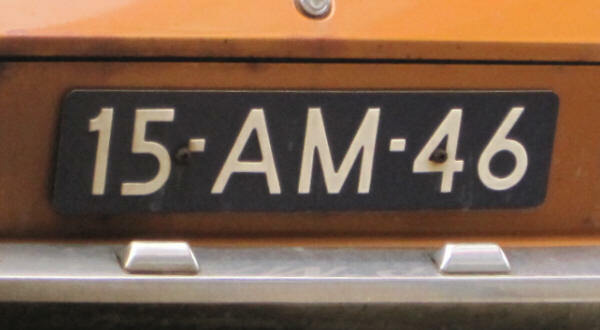 The combination AM is used since 2005. The registration consists of the letter A, followed by one letter, a hyphen, two numerals, a hyphen and to numerals. Pre-1973 series since 1988 issued between 1988 and 1998 in white on blue. Pre-1973 series since 1988 issued 1992 in white on blue. The registration consists of the letter D, followed by one letter above two numerals, a hyphen and to numerals. Current series for cars older than 25 years since 2005 in white on blue. The registration consists of the letters AM, followed a hyphen, two numerals, a hyphen and to numerals. This plate is made in a smaller American size. Current youngtimer series since 1st January 2001 in black on yellow. The registration consists of two numerals, a hyphen, the letters YA, a hyphen and two other numerals. 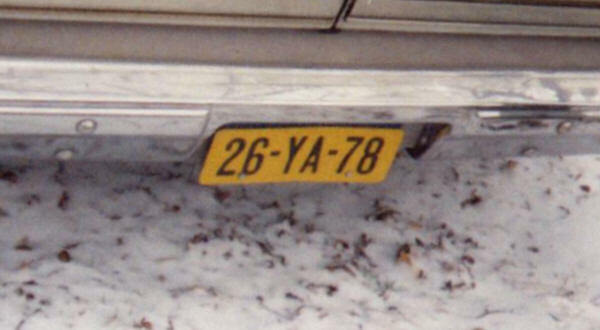 This series is used for cars build between 1973 and 1977. Current youngtimer series since 1st January 2001 in white on black. The registration consists of two numerals, a hyphen, the letter Y, one letter, a hyphen and two other numerals. 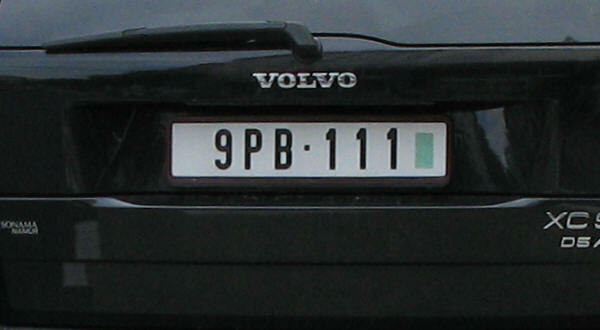 Current youngtimer series since 1st January 2001, two-line plate in white on black. 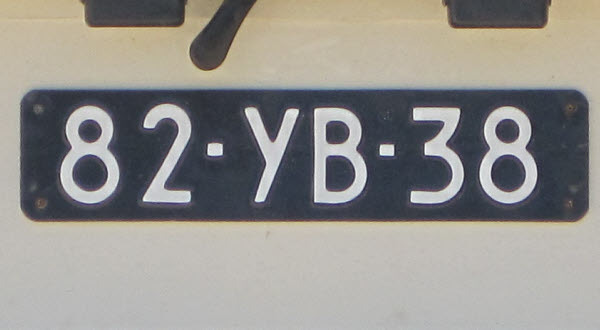 The registration consists of two numerals above the letter Y, one letter, a hyphen and two other numerals. Current export series since 1st January 2014 in black on white. No coding system anymore, instead the normal format is used. Former export series issued between 1994 and 31th December 2013 in black on white. The registration consists of three characters, a hyphen and three characters. 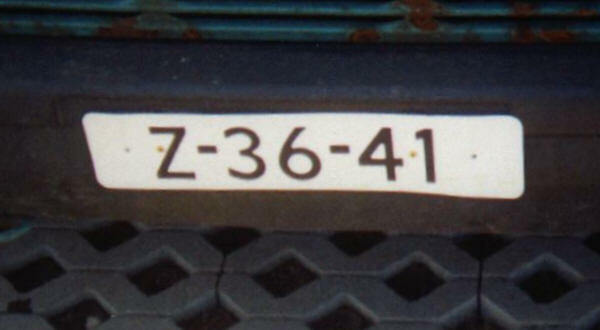 There is a system that codes the date of issue and a four-digit serial number. 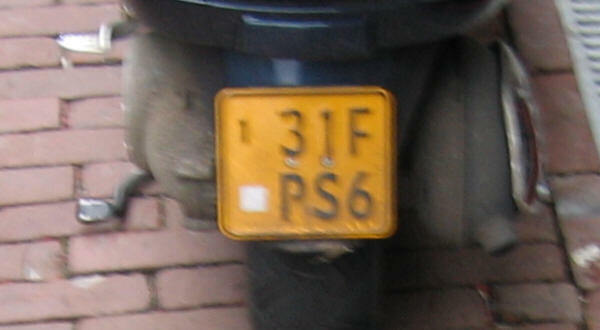 P stands for 2008 (or 1998), N stands for August and 2 stands for 2, thus 2nd August 2008 (1998). 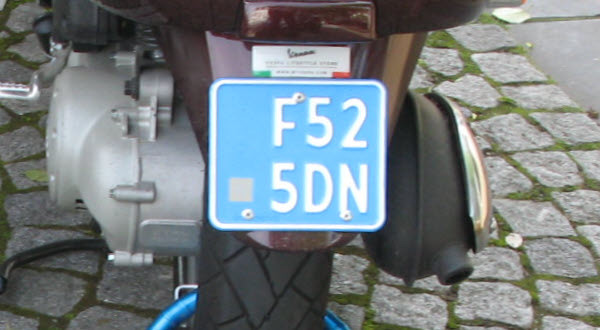 The first and two last numerals (6,03) make the serial 0603. 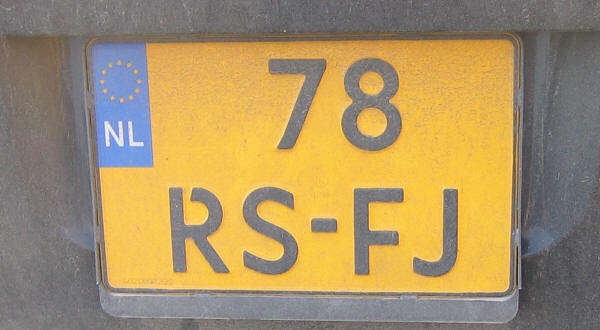 R stands for 2009, M stands for July and 6 stands for 6, thus 6th July 2009. 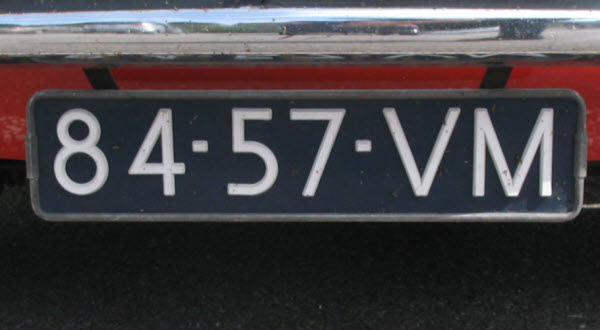 The first and two last numerals (7,14) make the serial 0714. The registration consists of one characters, a hyphen, two characters, a hyphen and three characters. G stands for 2003, N stands for August and 1 stands for 1, thus 1st August 2003. 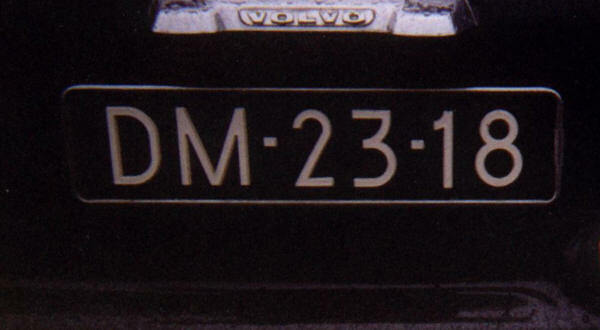 The first and two last numerals (2,12) make the serial 0212. 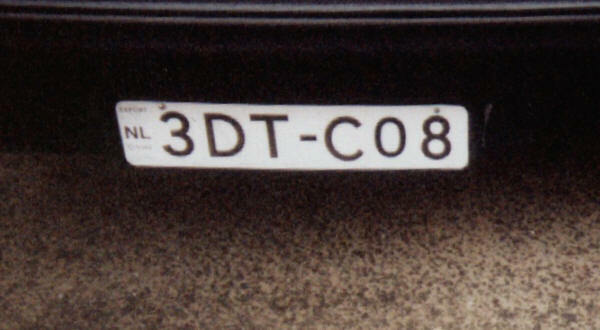 D stands for 2001 (or 1991), T stands for November and C stands for 12, thus 12th November 2001 (1991). 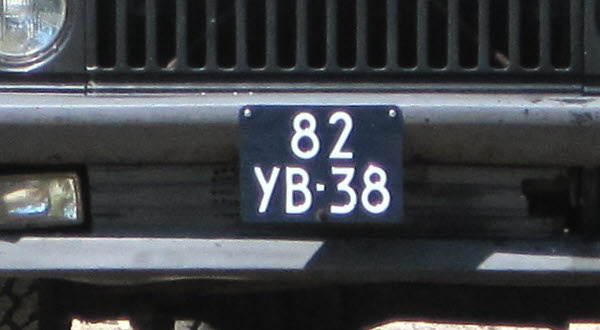 The first and two last numerals (3,08) make the serial 0083. 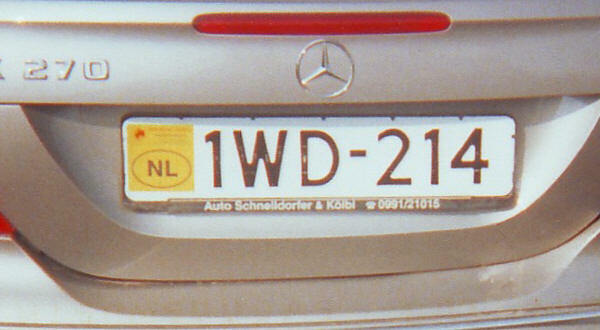 Note the NL oval at the left hand side on the plate. 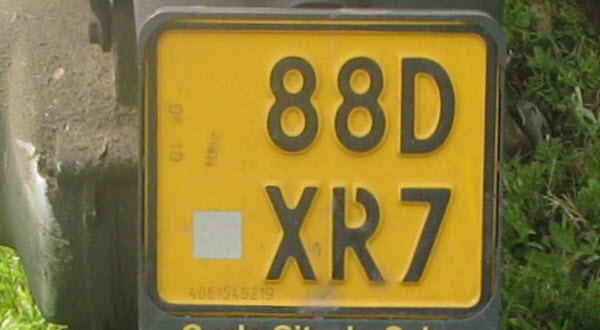 Former export series issued between 1994 and 31th December 2013 in black on white, printed plate on some piece of paper. The registration consists of three characters, a seal and three characters. 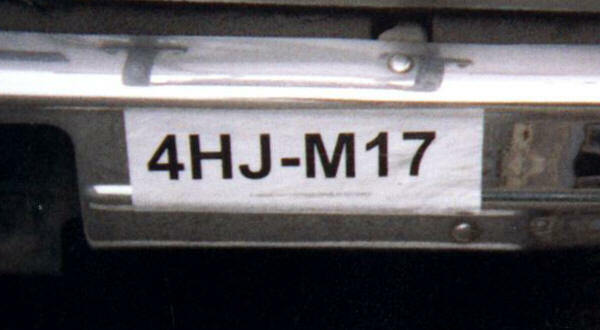 H stands for 2004 (or 1994), J stands for June and M stands for 21, thus 21th June 2004 (1994). 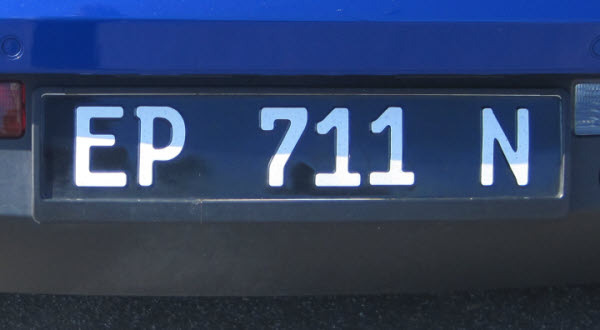 The first and two last numerals (4,17) make the serial 0174. 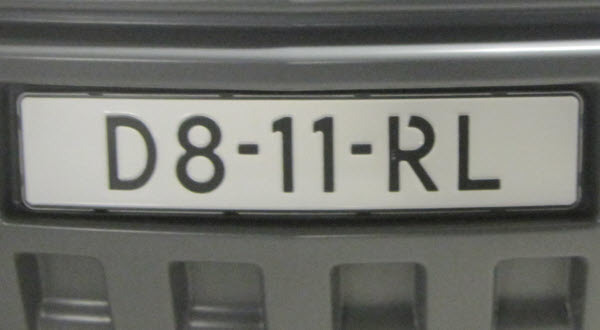 The R stands for 2009, the first M stands for July and the second M stands for 21, thus 21th July 2009. 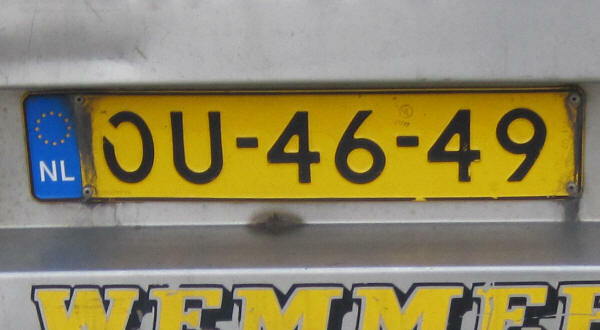 The first and two last numerals (7,50) make the serial 0507. 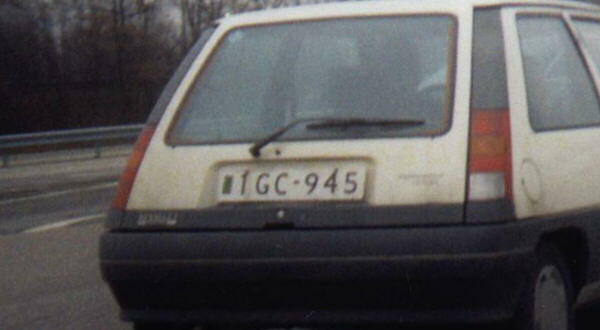 The G stands for 2003, the R stands for October and the I stands for 17, thus 17th October 2003. 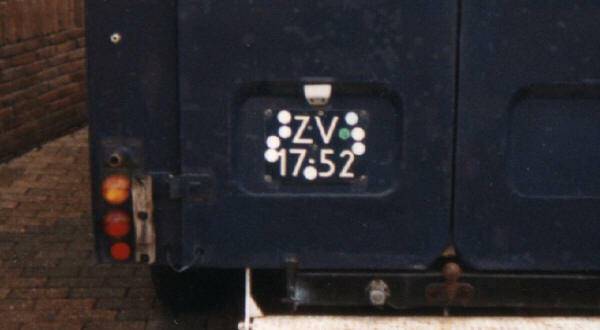 The first and two last numerals (7,27) make the serial 0277. 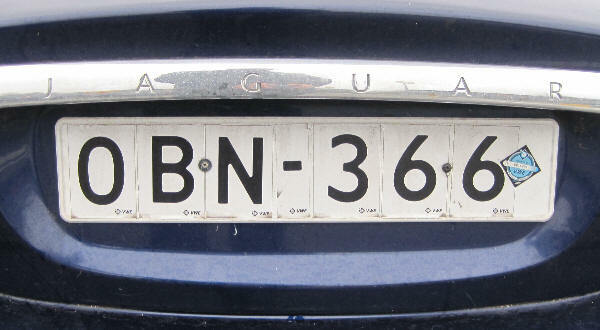 B stands for 2000 (or 2010), N stands for August and 3 stands for 3, thus 3rd August 2010 (2000). 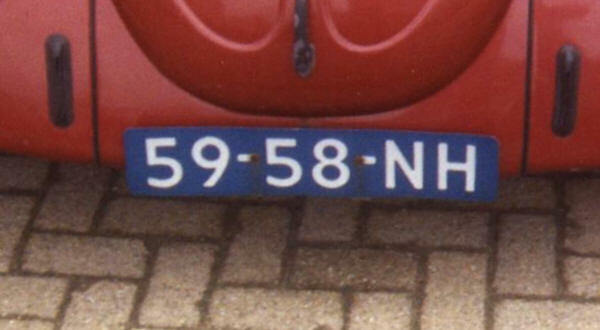 The first and two last numerals (0,66) make the serial 0660. The registration consists of three characters and three characters. 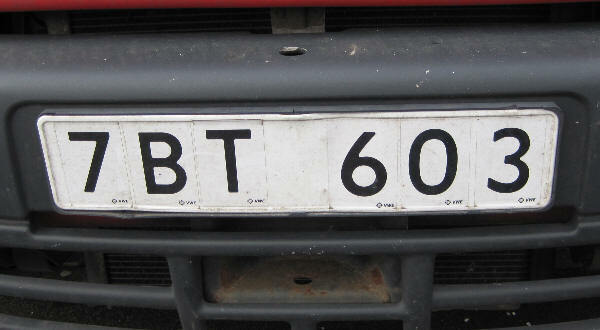 B stands for 2000 (or 2010), T stands for November and 6 stands for 6, thus 6th November 2010 (2000). 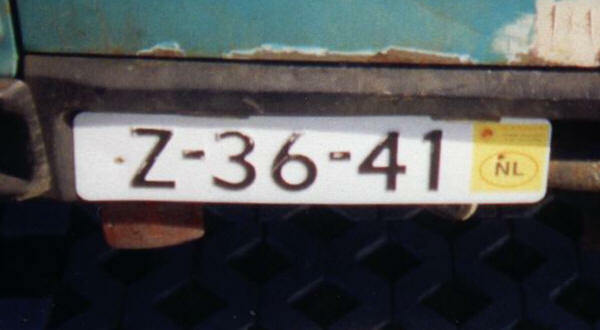 The first and two last numerals (7,03) make the serial 0037. 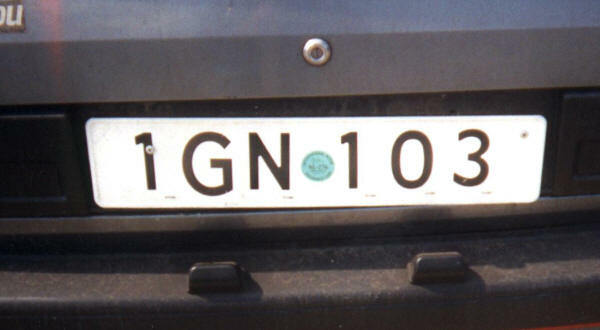 G stands for 2003 (or 1993), N stands for August and 1 stands for 1, thus 1st August 2003 (1993). The first and two last numerals (1,03) make the serial 0031. I don´t have any information about the seal instead of the hyphen. 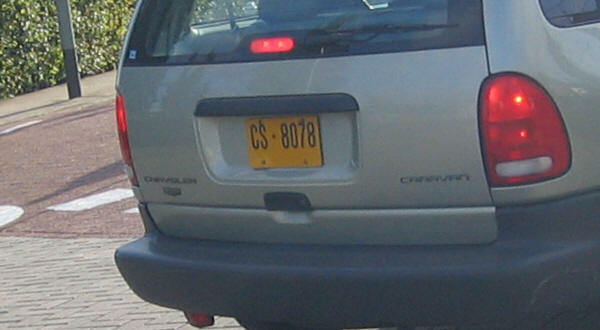 G stands for 2003 (or 1993), C is not in my code list and 9 stands for 9, thus 9th ?? 2003 (1993). 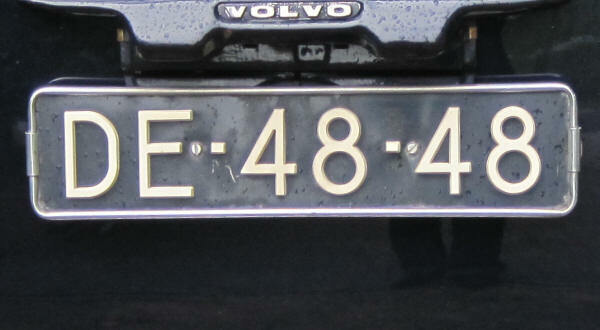 The first and two last numerals (1,45) make the serial 0451. At the left is some kind of seal, meaning unknown. W is an unknown year, D is February and 2 stands for 2, thus 2nd February ??. 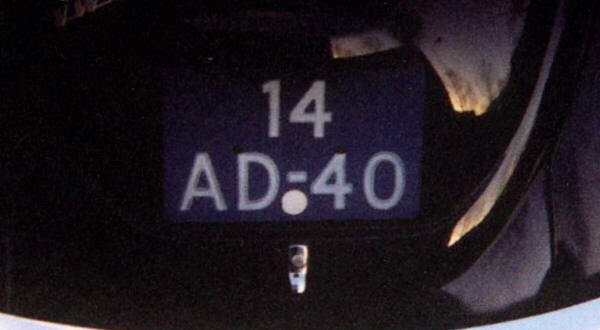 The first and two last numerals (1,14) make the serial 0141. At the left is an unknown seal with the oval. 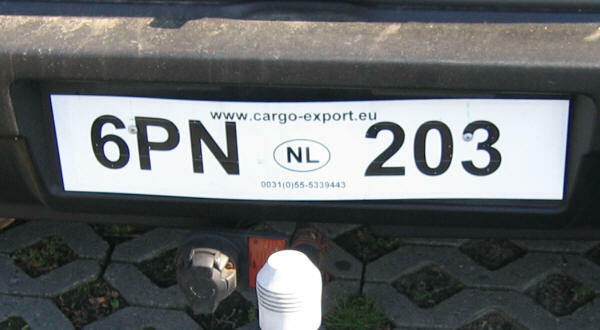 Former export series issued between 1994 and 31th December 2013 in black on white, painted characters. 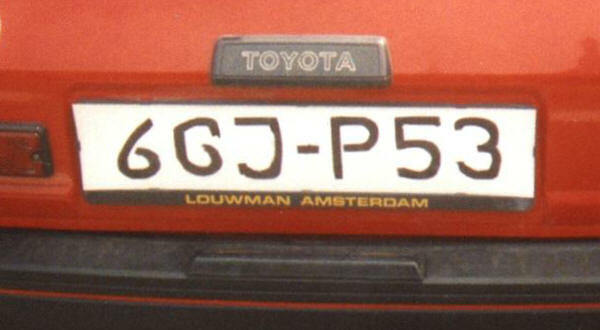 G stands for 2003 (or 1993), J stands for June and P stands for 24, thus 24th June 2003 (1993). 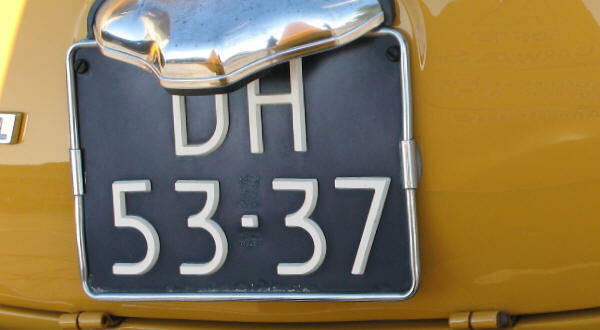 The first and two last numerals (6,53) make the serial 0536. 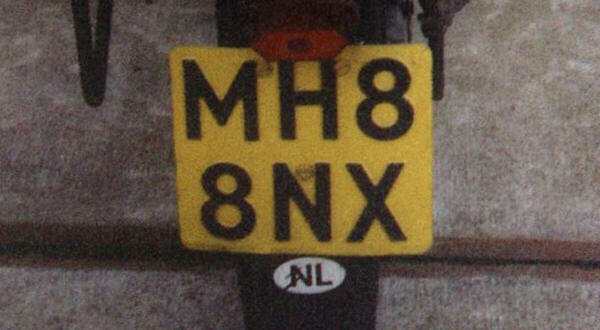 N stands for 2007 (or 1997), M stands for July and 5 stands for 5, thus 5th July 2007 (1997). 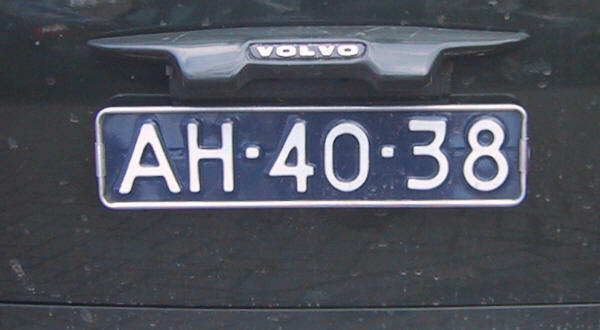 The first and two last numerals (0,33) make the serial 330. 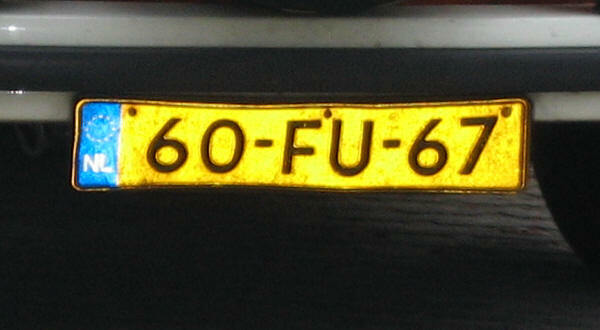 The registration consists of six characters. 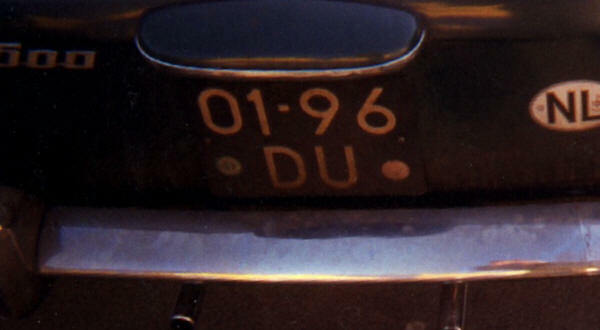 D stands for 2001 (or 1991), P stands for September and B stands for 11, thus 11th September 2001 (1991). 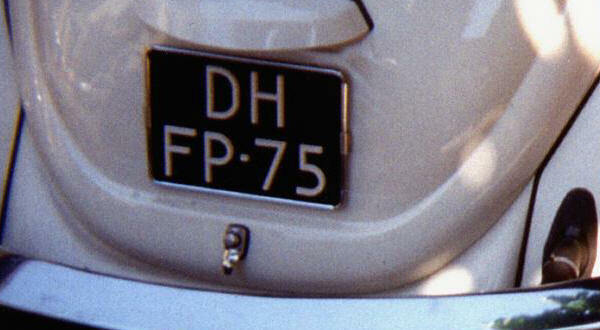 The first and two last numerals (9,57) make the serial 579. 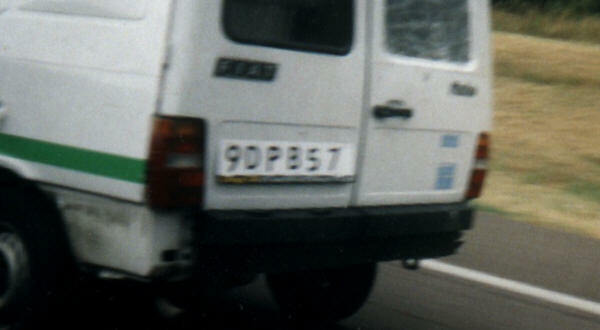 P stands for 1998 (or 2008), B stands for January and 1 stands for 1, thus 1st January 1998 (2008). 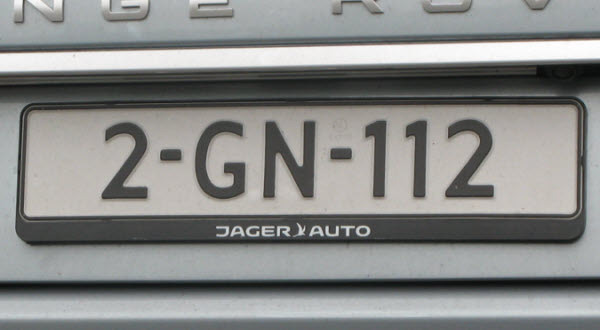 The first and two last numerals (9,11) make the serial 119. Former export motorcycle series issued between 1994 and 31th December 2013 in black on white. 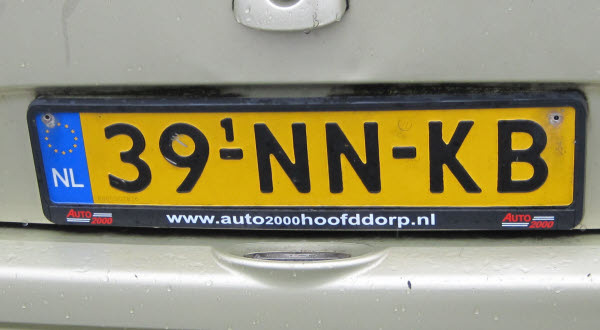 The registration consists of two characters, a hyphen, two characters, a hyphen and two characters. 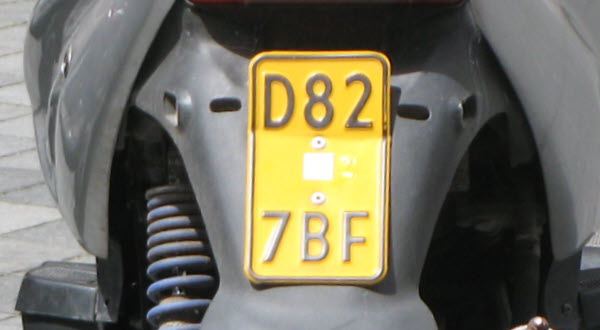 The coding system for motorcycles is different to those for cars. No details are known on this export motorcycle system. 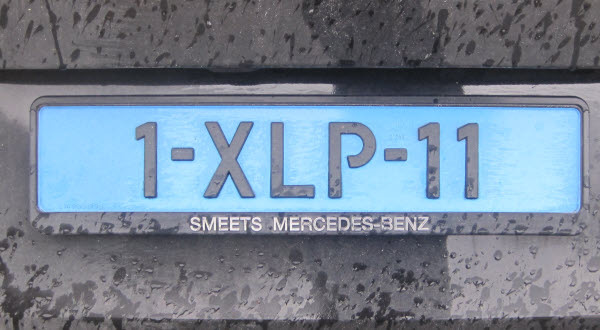 Current taxi series issued since March 2013 in black on blue, without euroband. The registration consists of one numerals, followed by a hyphen, three letters, a hyphen and two numerals. 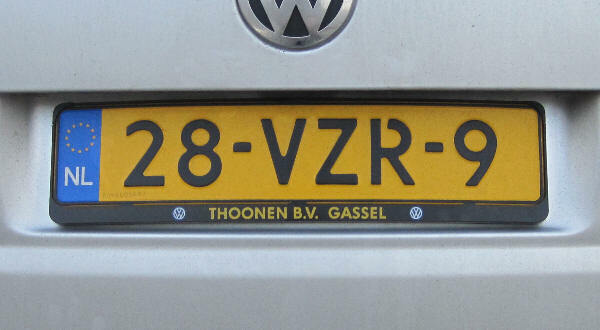 Former taxi series issued between May 2008 and March 2013 in black on blue, without euroband. 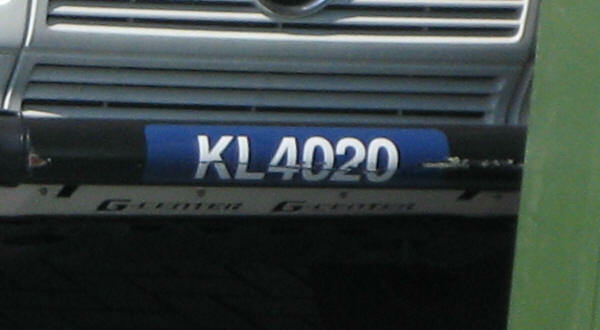 Former taxi series issued between 1st July 2000 and May 2008 in black on blue, without euroband. The registration consists of two numerals, a hyphen, two letters, a hyphen and two letters. The registration consists of two letters, a hyphen, two letters, a hyphen and two numerals. Current provisional replacement series in black on white. 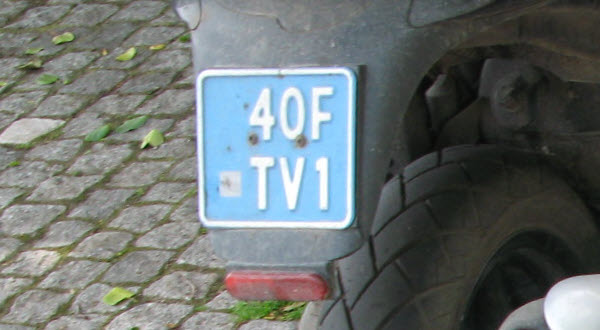 Above the first hyphen is a small 1, indicating a first replacement plate. 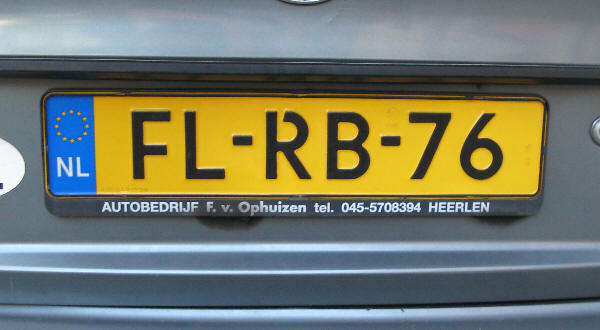 Note that there is no euroband on provisional plates. Current provisional series valid for seven days since 2000 in black on white. The registration consists of the letter Z, followed by a hyphen, two numerals, a hyphen and two numerals. 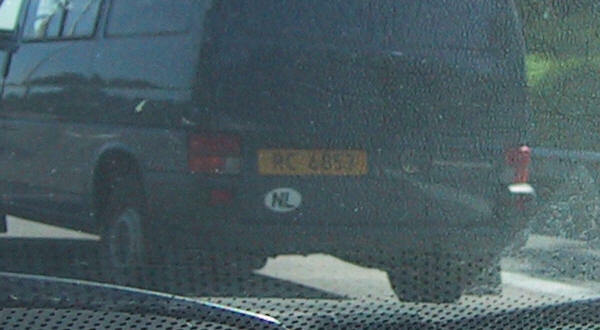 Right of the registration is a yellow sticker with the oval NL. Below the first hyphen is a green sticker. Motorcycle replacement series since 1999 in black on yellow. The registration consists of the letter M, followed by one letter, above two numerals, a hyphen and two letters. 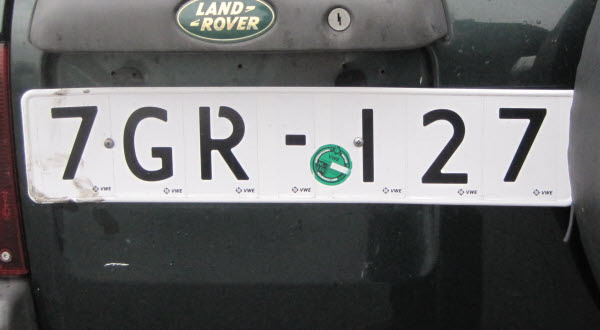 Top left is a small 1, indicating a first replacement plate. 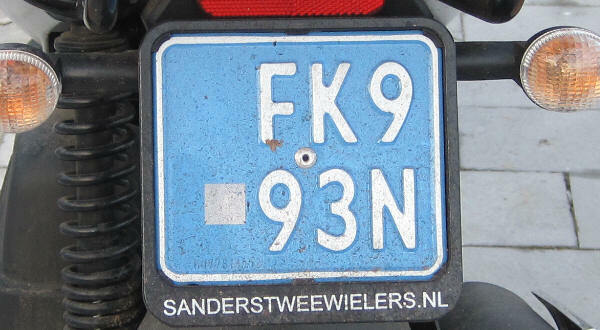 Top left of the plate is a blue euroband with the oval NL below the twelve golden European stars. Current motorcycle series since 1999 in white on Prussian blue. The registration consists of the letter M, followed by one letter above two numerals, a hyphen and two letters. 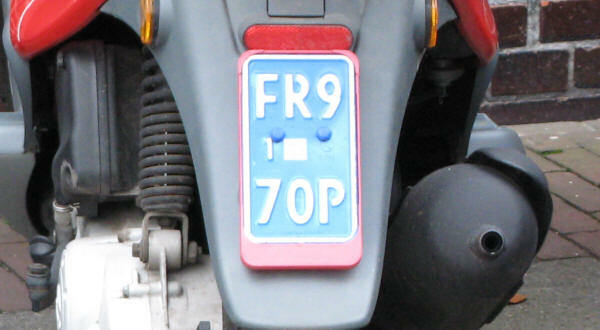 Former motorcycle series issued between 1951 and 1979 in white on blue. 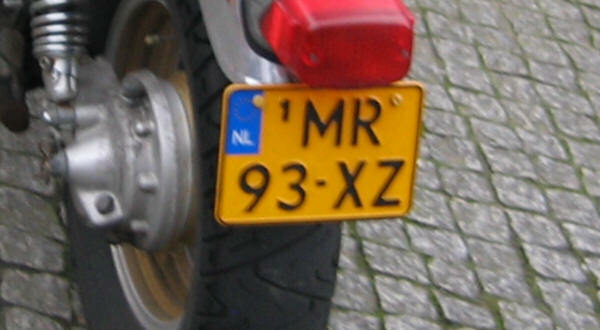 Former motorcycle series issued between 1979 and 1999 in black on yellow. The registration consists of the letter M, followed by on letter, one numeral, above one numeral and two letters. 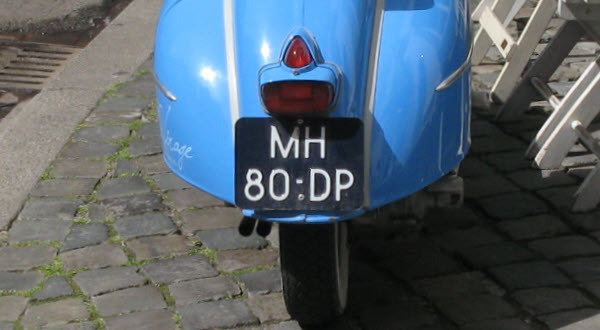 Current moped series since 1st September 2005 in white on blue with a white border. The registration consists of one letter, two numerals above one numeral and two letters. Bottom left is a security hologram. 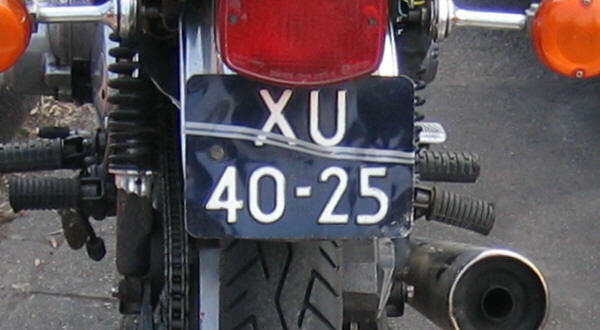 The white on blue plates are issued for mopeds with maximum speed of 25 km/h. The registration consists of two numerals and one letter above two letters and one numeral. The registration consists of two letters and one numeral above two numerals and one letter. In the centre of the plate is a security hologram. 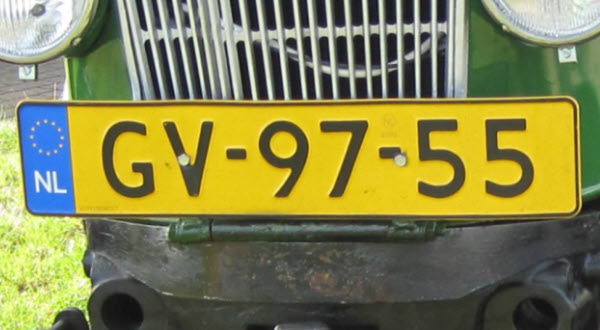 This is the original registration where in the middle of the registration is a small 1, indicating a first replacement plate. 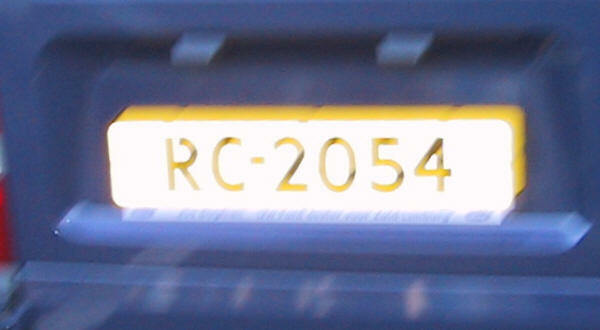 Bottom left of the plate is a security hologram. 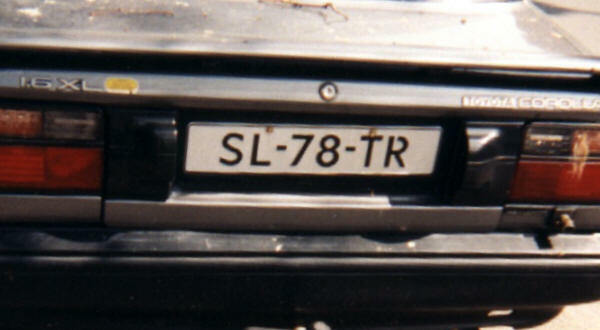 This is the original registration where top right of the registration is a small 2, indicating a second replacement plate. 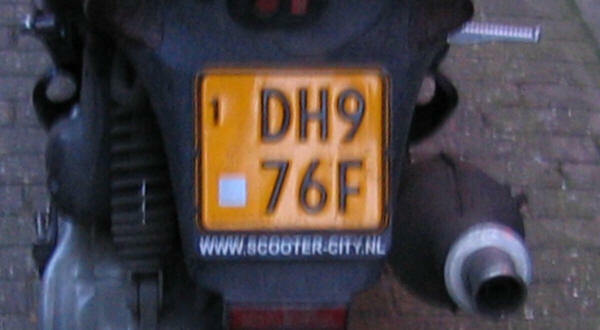 Current moped series since 1st September 2005 in black on yellow with a black border. 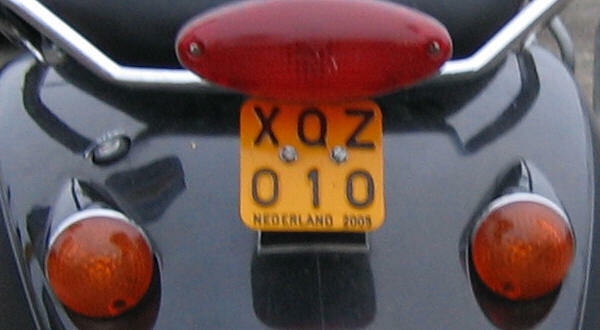 The black on yellow plates are issued for mopeds with maximum speed of 40 km/h. The registration consists of one letter and two numerals above one numeral and two letters. 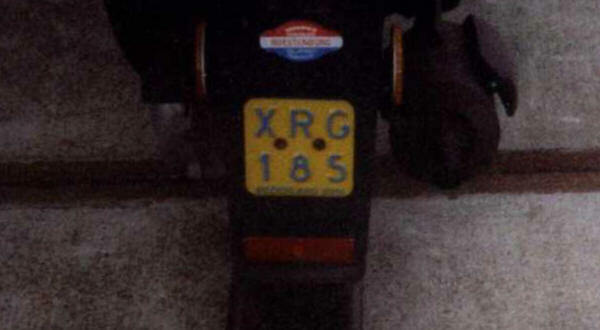 Current moped, replacement series since 1st September 2005 in black on yellow with a black border. 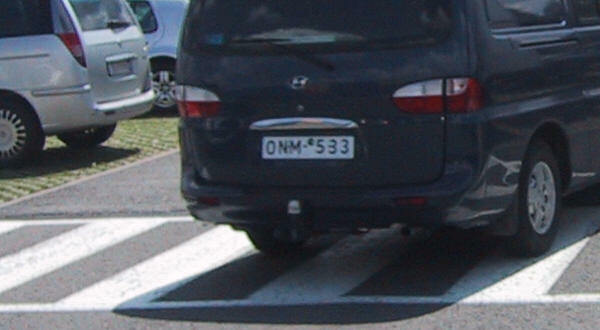 Bottom left of the plate is a security hologram. 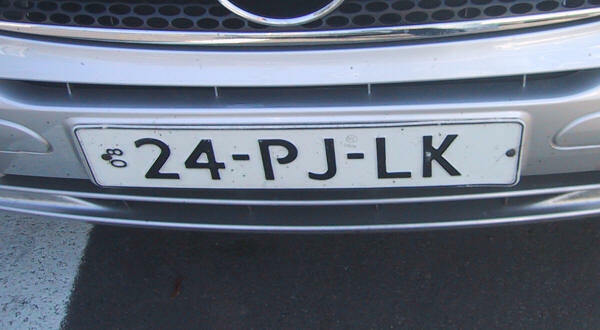 Top left is a small 1, indicating a first replacement plate. When it happens again, the number will be 2. This continues until 4. After that a new plate will be handed out. 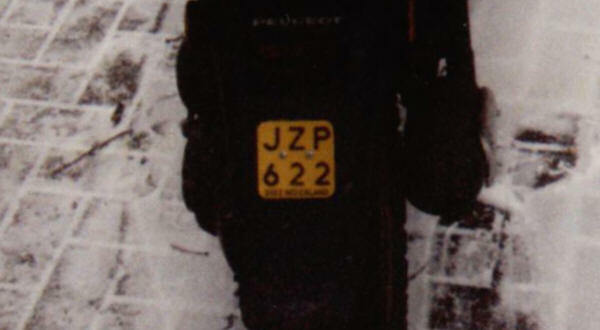 Current moped, temporary replacement series since 1st September 2005 in black on white with a black border. 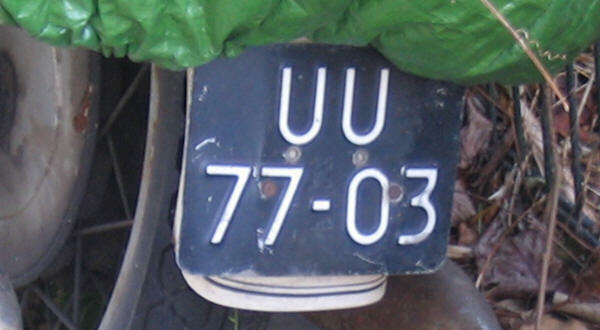 This is the original registration that is proceeded by two small numerals indicating the month of expiry, in this case January (01). 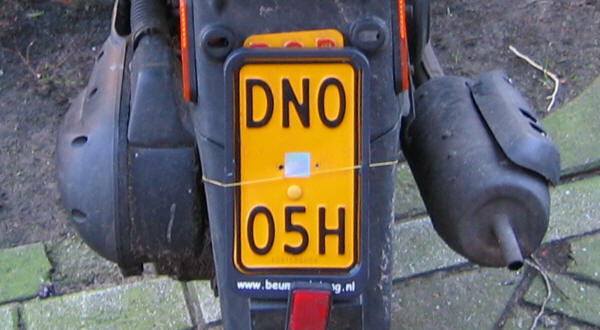 Former moped series, issued until 1st September 2005 in red on yellow. 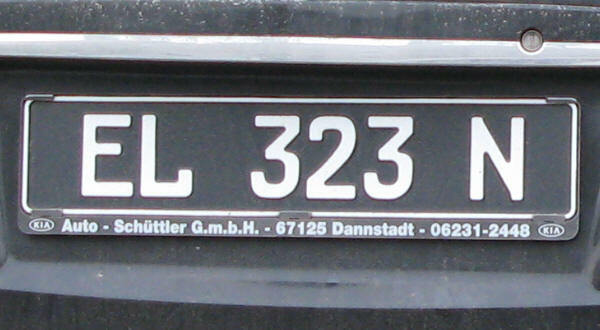 The registration consists of three letters above three numerals. 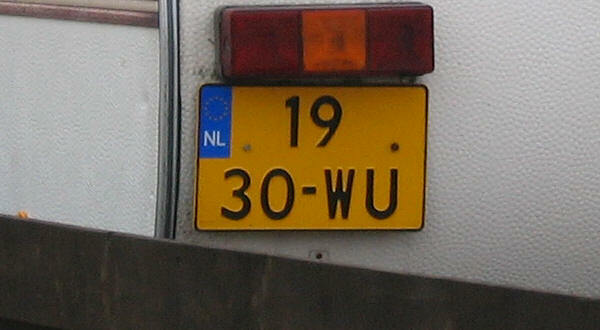 At the bottom of the plate is NEDERLAND, followed by the year in red, in this case 2006. 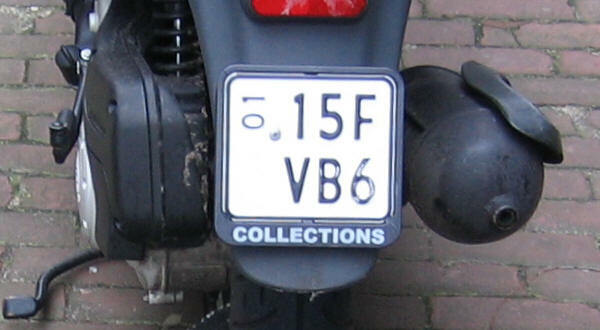 Former moped series, issued until 1st September 2005 in black on yellow. 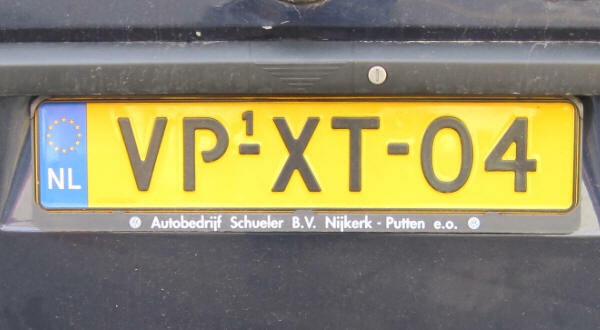 At the bottom of the plate is NEDERLAND, followed by the year in black, in this case 2005. 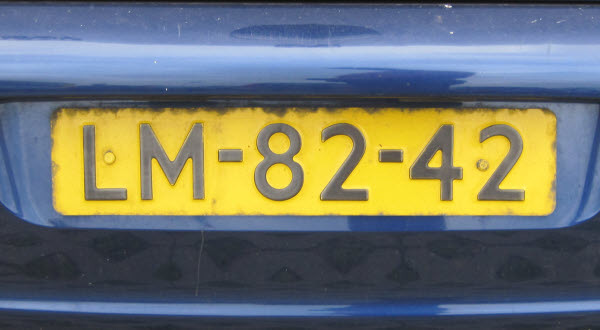 Former moped series, issued until 1st September 2005 in blue on yellow. 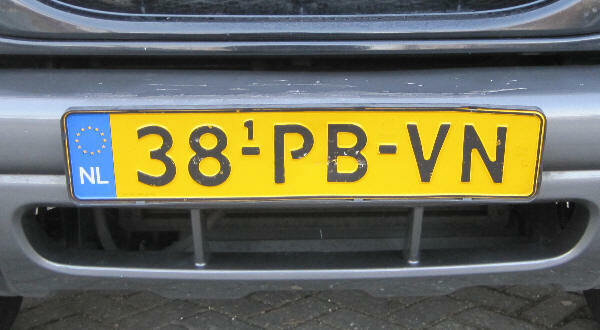 At the bottom of the plate is NEDERLAND, followed by the year in black. 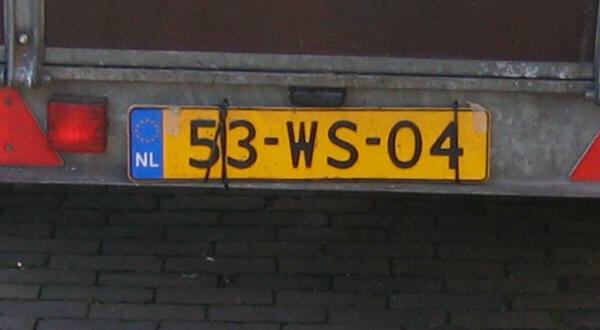 At the bottom of the plate is the year in black, in this case 2005, followed by NEDERLAND. Current commercial series (< 3500 kg) since 13 December 2012 in black on yellow. The registration consists of the letter V and one letter, followed by a hyphen, three numerals, a hyphen, and one letter. 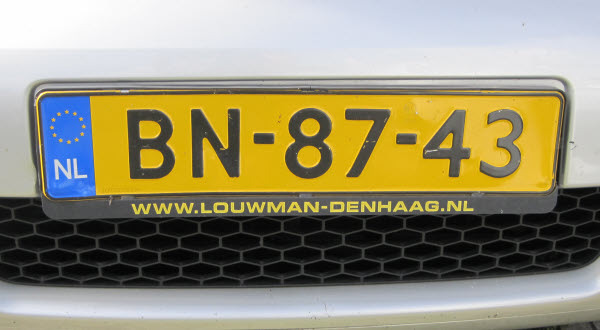 Top left of the registration is a blue euroband with the oval NL in white below the twelve gold European stars. 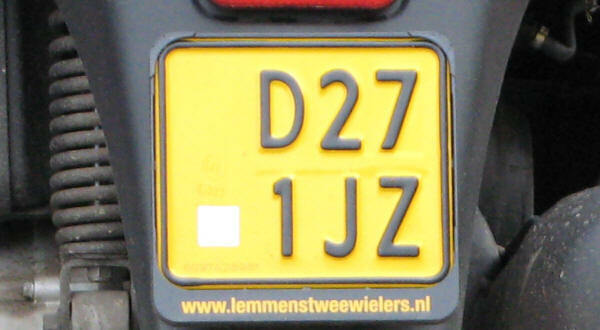 Former commercial series (< 3500 kg) issued between 28th February 2009 and 13th December 2012 in black on yellow. The registration consists of one numeral, followed by a hyphen, the letter V and two letters, a hyphen, and two numerals. 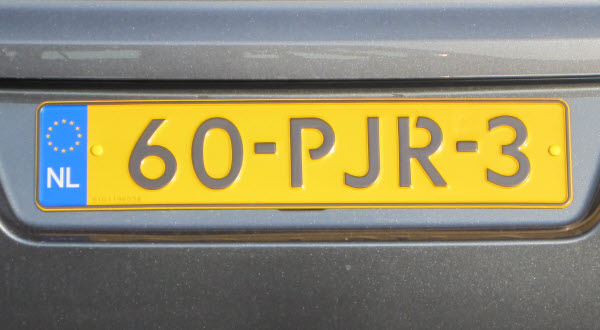 Former commercial series (< 3500 kg) issued between 28th February 2009 and 13th December 2012, two-line plate in black on yellow. The registration consists of one numeral, followed by a hyphen, the letter V, above two letters, a hyphen, and two numerals. 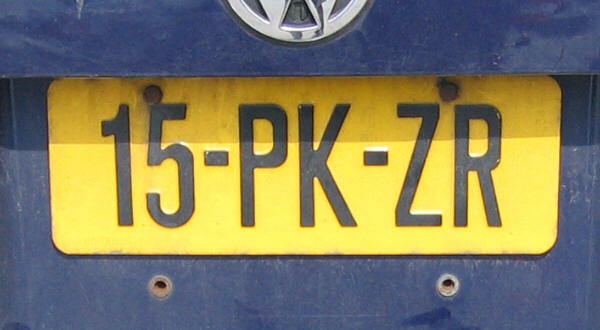 Former commercial series (< 3500 kg) issued between 2nd October 2006 and 27th February 2009 in black on yellow. The registration consists of two numerals, followed by a hyphen, the letter V and two letters, a hyphen, and one numeral. 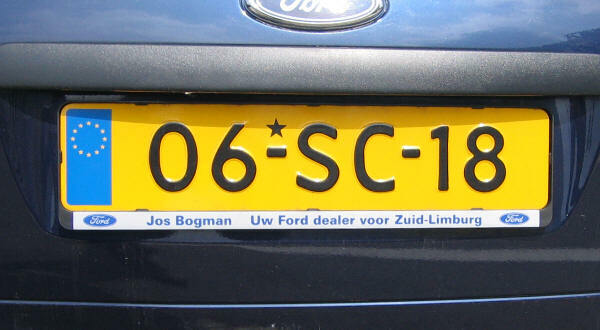 Left of the registration is a blue euroband with the oval NL in white below the twelve gold European stars. 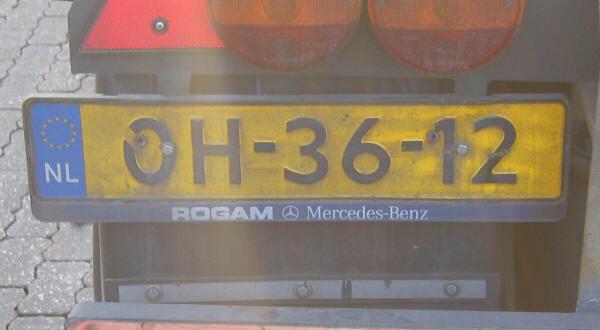 Former light commercial series (< 3500 kg), issued between July 1998 and October 2006 in black on yellow, with euroband since 1st February 2000. The registration consists of two numerals, a hyphen, two letters, a hyphen, the letter V and another letter. 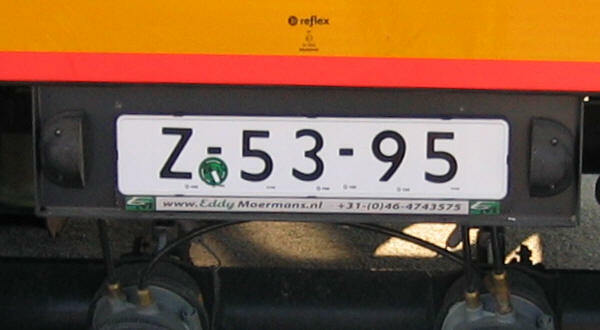 Former light commercial series (< 3500 kg), issued between Janury 1994 and July 1998 in black on yellow. The registration consists of the letter V and another letter, a hyphen, two letters, a hyphen and two numerals. 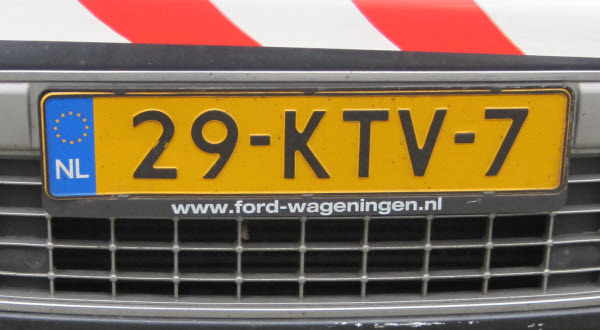 Former light commercial series (< 3500 kg), issued between May 1988 and January 1994 in black on yellow, with euroband since 1st February 2000 (remade). The registration consists of the letter V and another letter, a hyphen, two numerals, a hyphen and two letters. 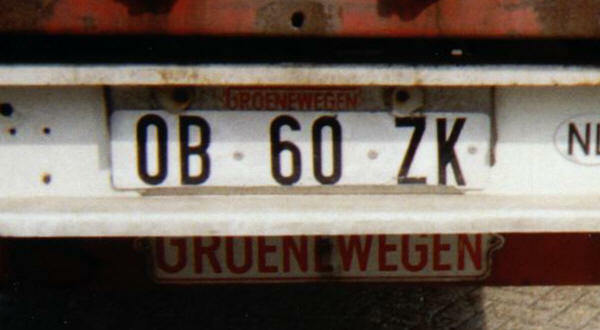 Former heavy commercial series (> 3500 kg), issued between 1988 and 2nd October 2006 in black on white. The registration consists of the letter B, followed by one letter, a hyphen, two letters, a hyphen and two numerals. 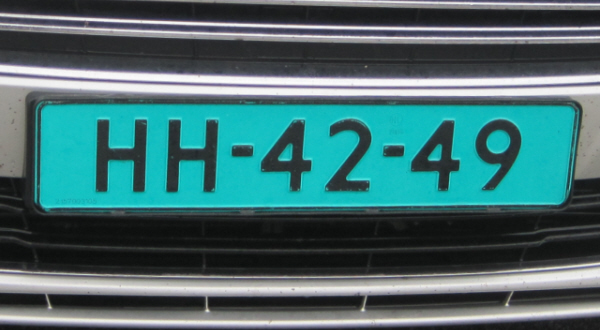 Current dealer plate since February 2000 in black on green. 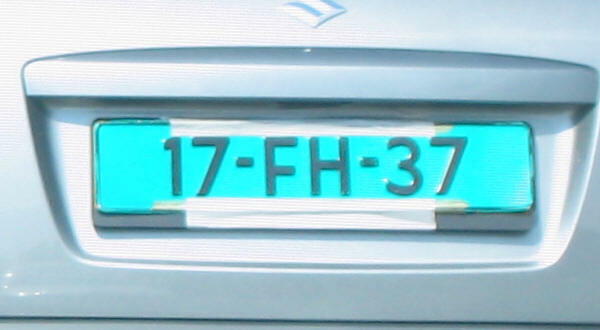 The registration consists of two numerals, followed a hyphen, the letters FH, a hyphen and two numerals. 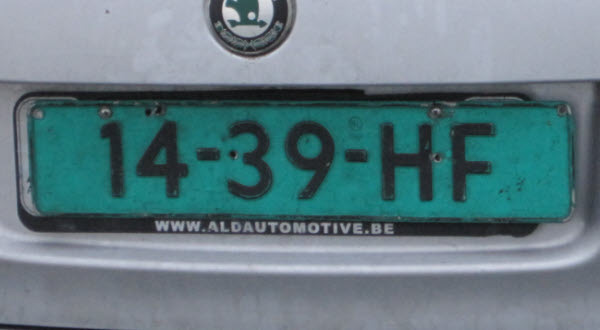 Current trade plate since February 2000 in black on green. The registration consists of the letters HA (or HF or HH), followed by a hyphen, the numerals, a hyphen and two numerals. The registration consists of two numerals, followed by a hyphen, the letters HA (or HF or HH), a hyphen and two numerals. 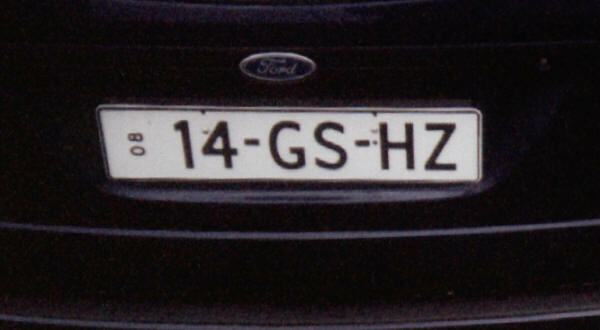 The registration consists of two numerals, above the letters HA (or HF or HH), a hyphen and two numerals. The registration consists of two numerals, followed by a hyphen, two numerals, a hyphen and the letters HA (or HF or HH). Current temporary series in black on yellow. 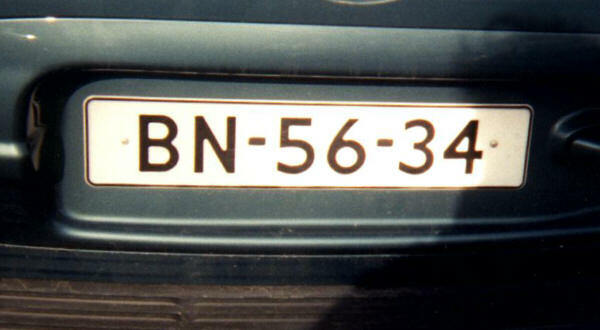 The registration consists of the letters BN (or GN), followed by a hyphen, two numerals, a hyphen and two numerals. The serials between 80-00 and 88-89 are issued to non-diplomatic embassy personnel. 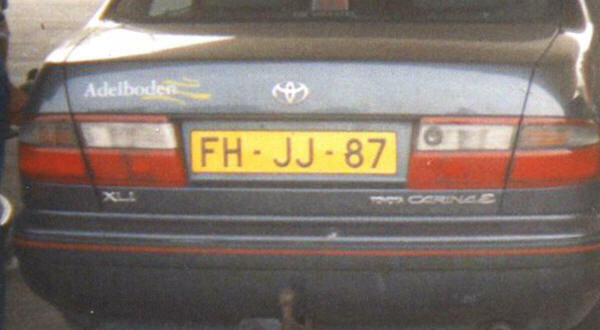 Left of the registration is a blue euroband with the oval NL below the 12 European golden stars. 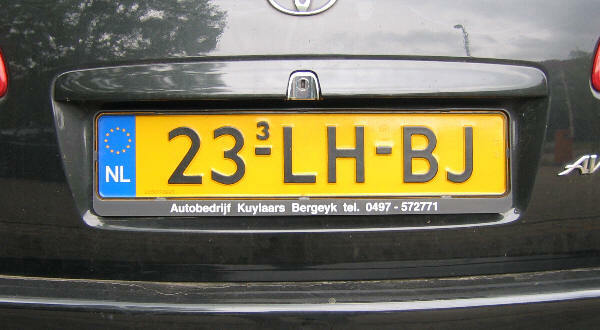 The registration consists of two numerals, followed by a hyphen, the letters BN (or GN), a hyphen and two numerals. U.S. and Belgian military personnel attached to NATO. 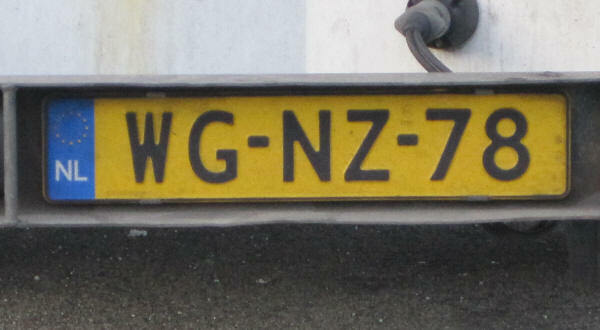 The registration consists of two numerals, followed by a hyphen, two numerals, a hyphen and the letters BN (or GN). 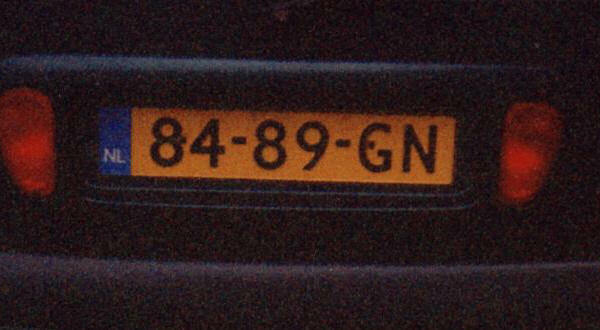 The registration consists of the letters GN (or BN), followed by a hyphen, two numerals, a hyphen and two numerals. The registration consists of two numerals, followed by a hyphen, the letters GN (or BN), a hyphen and two numerals. 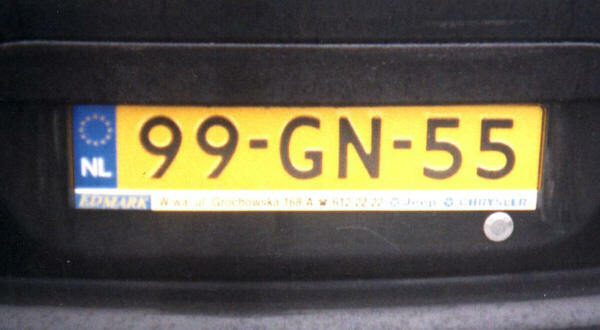 GN stands for foreigner (Geen Nederlander). 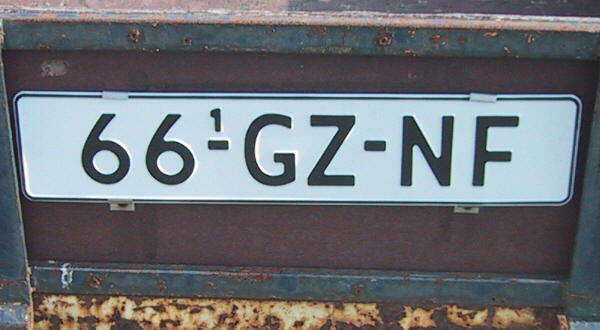 The registration consists of two numerals, followed by a hyphen, two numerals, a hyphen and the letters GN (or BN). Current temporary (provisional ?) series in black on white. 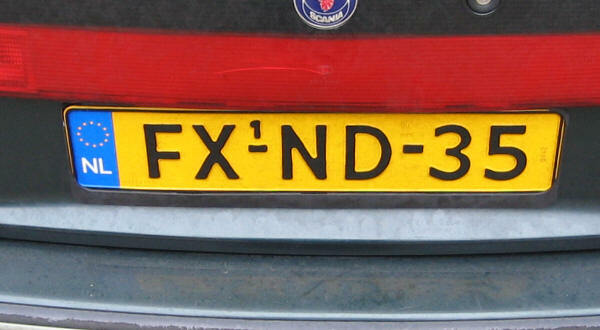 BN stands for foreigner (Buitenlander in Nederland). The serials between 00-01 and 59-99 are issued to temporary foreign European non-residents. Current abnormal load series in black on yellow. The registration consists of the letters ZZ, followed by a hyphen, two numerals, a hyphen and two numerals. 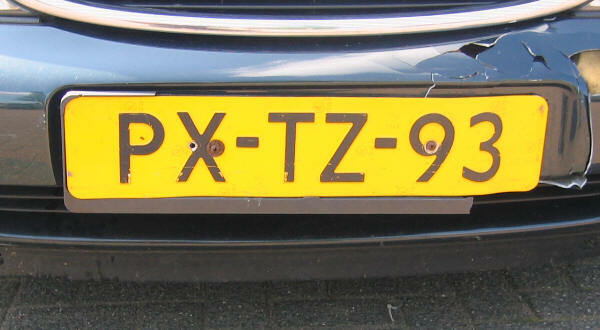 Former special series issued until 2007, front plate in black on yellow. The registration consists of the letters GV, followed by a hyphen, two numerals, a hyphen and two numerals. 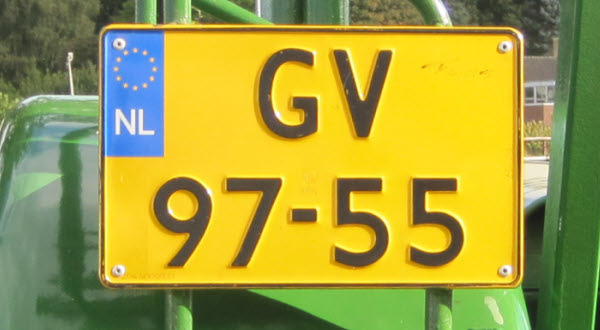 The letters GV (until 2007) are used for vehicles in frontier areas. 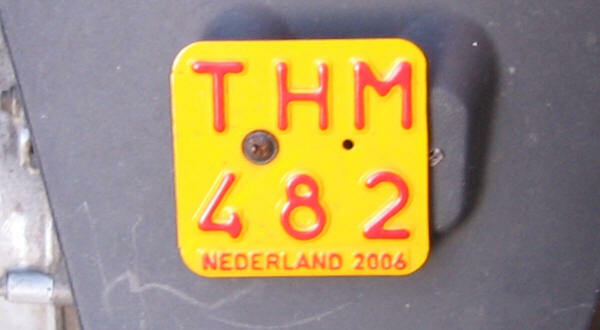 Former special series issued until 2007, rear plate in black on yellow. 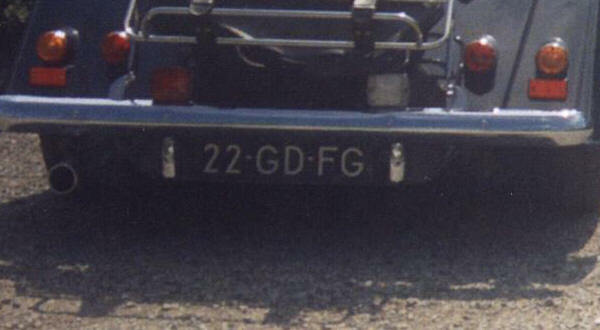 The registration consists of the letters GV above two numerals, a hyphen and two numerals. Current military series in black on yellow. 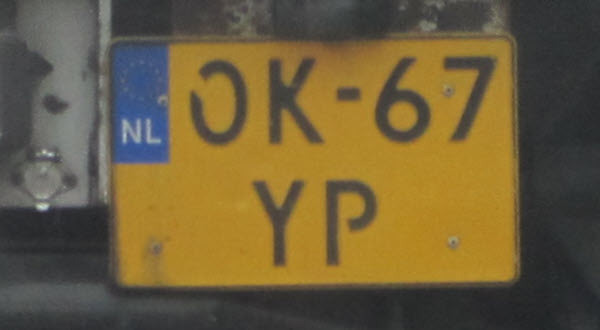 The letters KV are used for military police since 2001. 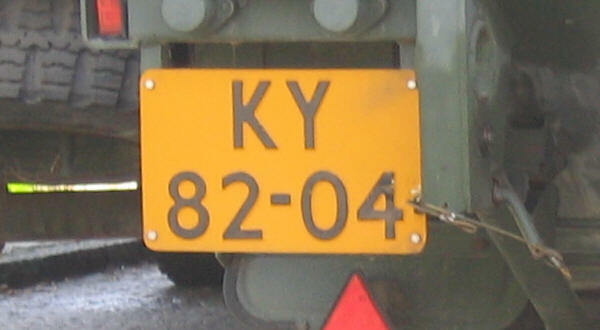 The letters KL and KN-KZ are used for army vehicles. The registration consists of two numerals, above two letters, a hyphen and two numerals. The registration consists of two numerals, followed by a hyphen, two numerals, a hyphen and two numerals. 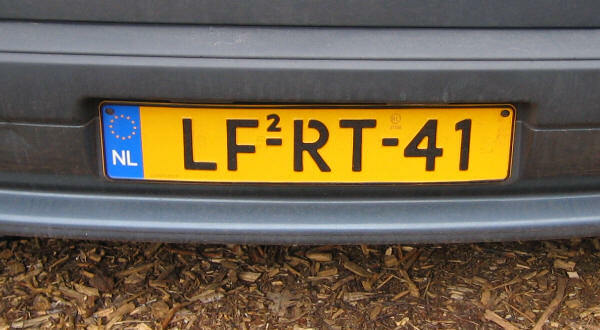 The letters LM are used for the Air Force vehicles. Current International Court of Justice series since 1991 in black on yellow. 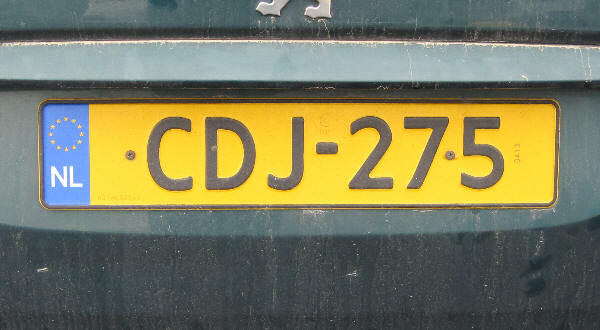 The registration consists of the letters CDJ, followed by a hyphen and three numerals. 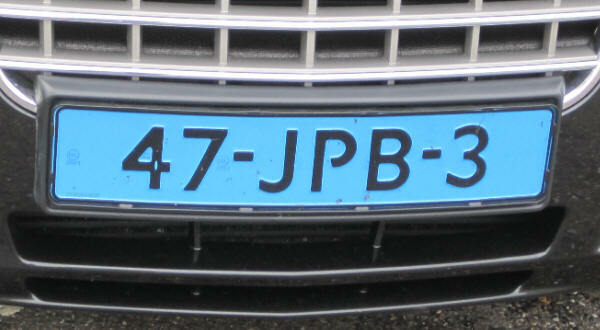 Left of the registration is a blue euroband with the oval NL in white below the twelve European golden stars. Former allied Forces Northern Europe series issued between 1992 and 2003 in black on yellow. 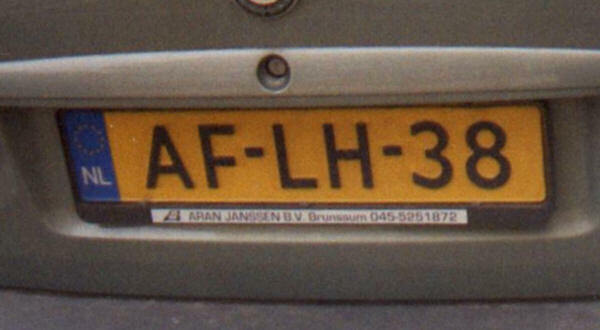 The registration consists of the letters AF, followed by a hyphen, two letters, a hyphen and two numerals. 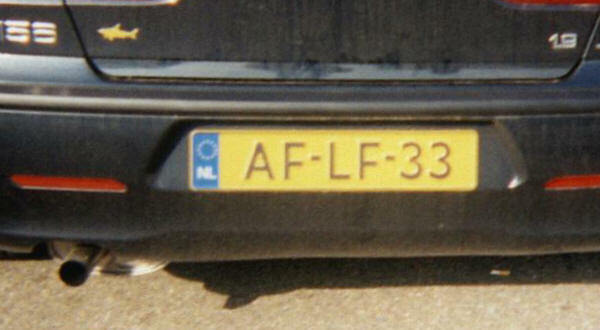 The letters AF stand for Allied Forces. 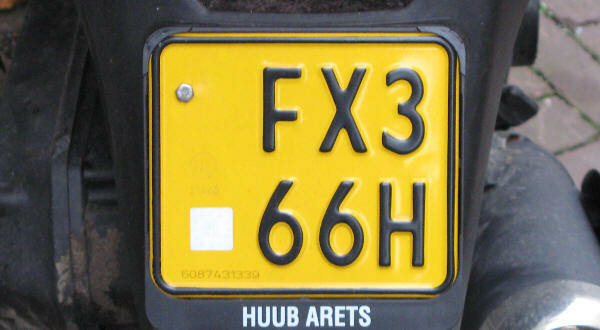 Current civilian vehicles at U.S. army bases in the Netherlands series since 2005 in black on yellow. 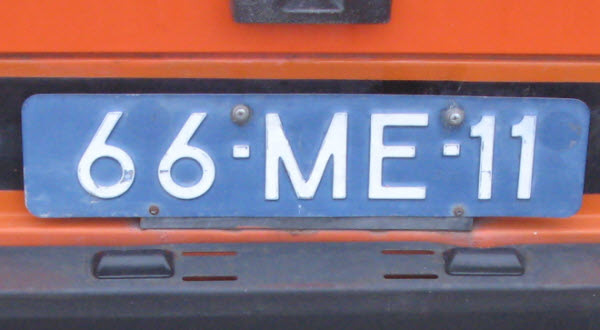 The first two numerals denote the year where 06 stands for 2006. On top of the first hyphen is a black star. 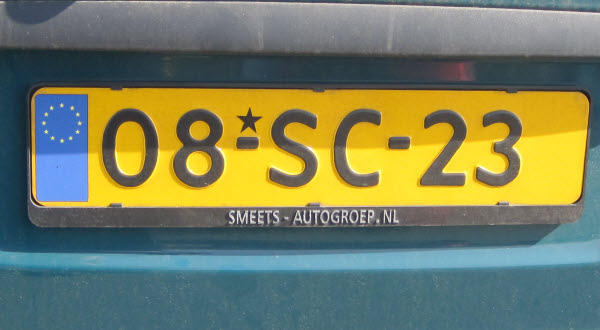 The two letters denote the base where SC stands for Schinnen. 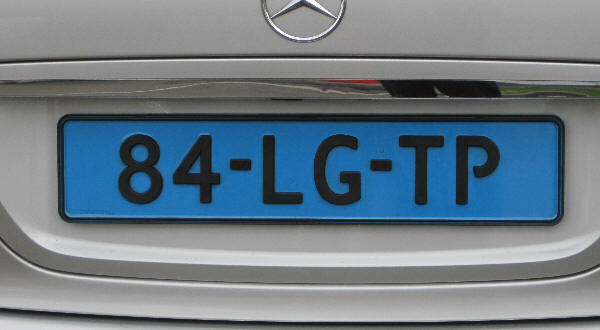 Left of the registration is a blue euroband with the twelve European golden stars without country indication. 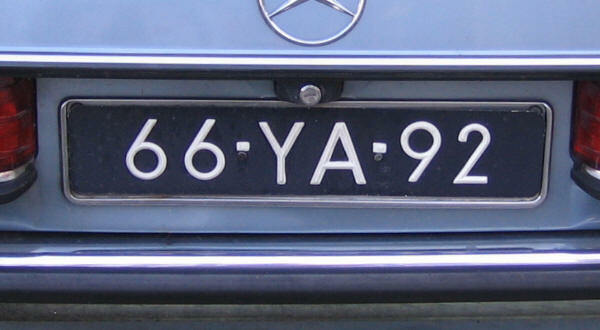 The first two numerals denote the year where 08 stands for 2008. On top of the first hyphen is a black star. 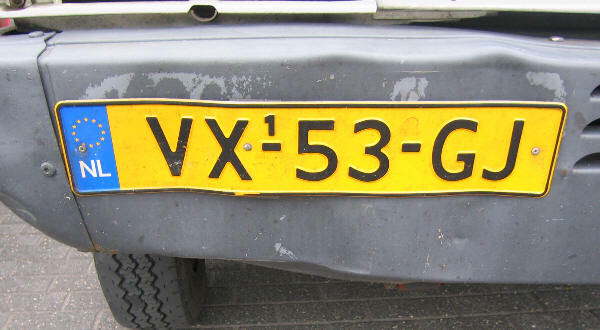 Former civilian vehicles at U.S. army bases in the Netherlands series issued between early 1980s and 2005 in black on yellow. The registration consists of the letter C, followed by one letter, a star and four numerals. Current NATO Region Central series in black on yellow. The registration consists of the letters RC, followed by a hyphen, two numerals, a hyphen and two numerals. RC stands for Region Central, AFNORTH. Current NATO Region Central series in black on yellow, no euroband. 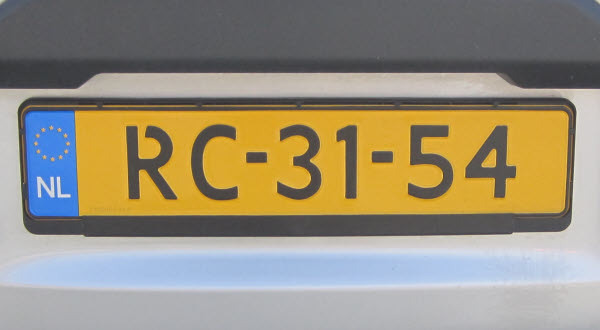 The registration consists of the letters RC, followed by a hyphen and four numerals. 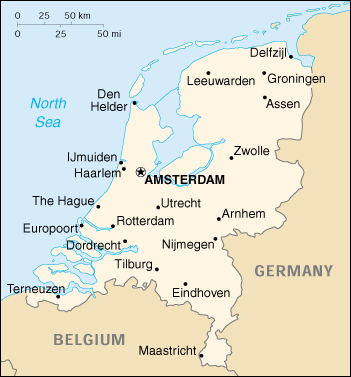 Current German Forces in the Netherlands series in yellow on black. 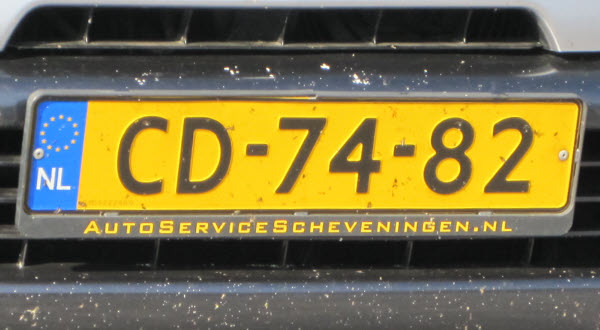 The registration consists of two letters, followed by two numerals and the letter D.
Current Netherlands Forces in Germany series since February 1975 in white on black with white border. 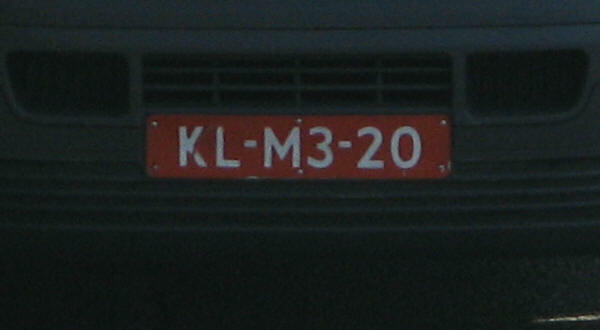 The registration consists of two letters, followed by three numerals and the letter N.
Special trailer series seen on Schiphol airport in black on white. 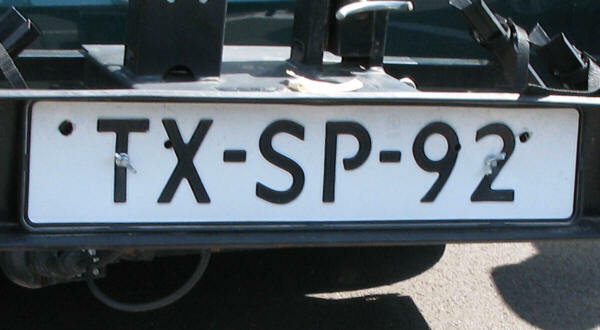 The registration consists of two letters, followed by six numerals. Nothing about this series is known. Many of these were seen. 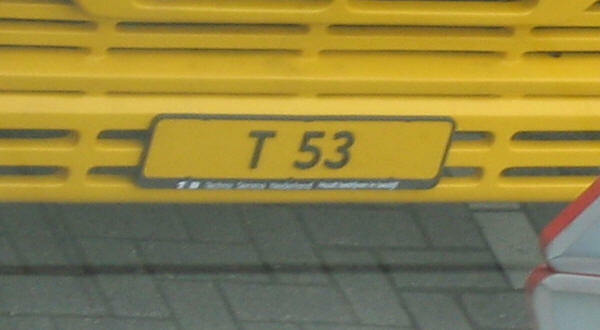 Special bus series seen on Schiphol airport in black on yellow. 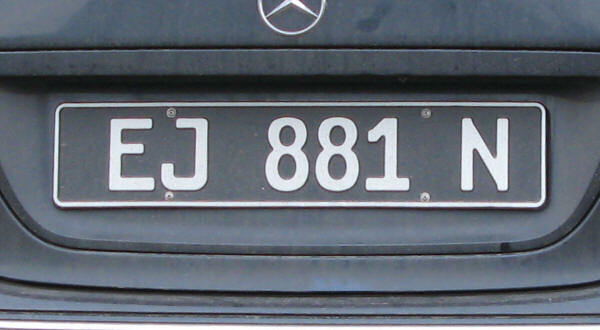 The registration consists of one letter, followed by two numerals. Airport series from KLM. Restricted to airport only. 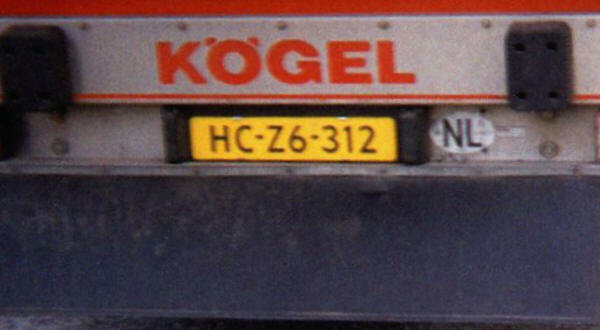 Trailer plate. 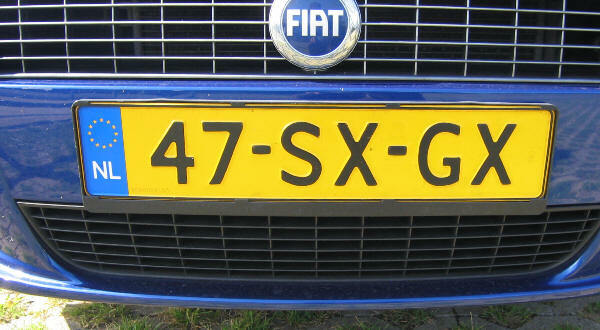 Not a usual Dutch plate. 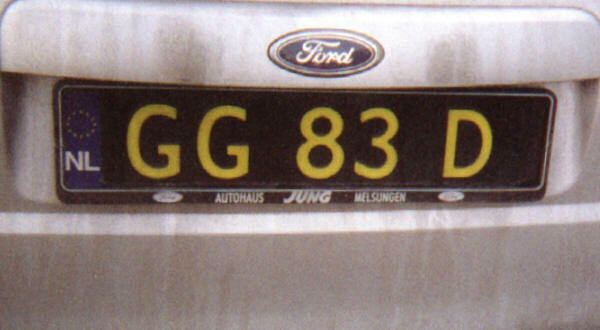 I don´t know more about this plate. 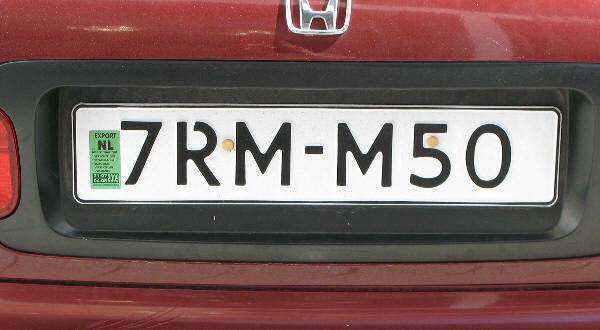 Could be a Czech plate, illegally spaced ? The registration consists of three numerals, a hyphen and again three numerals. 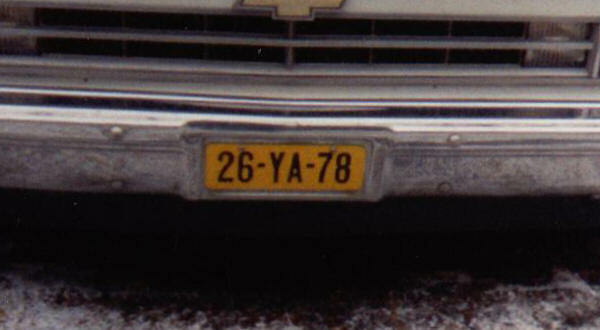 Illegal license plate. Old trailer series mounted on a car.